© 2003, © 2019 by Paul Freeman. Revised 2/10/19. 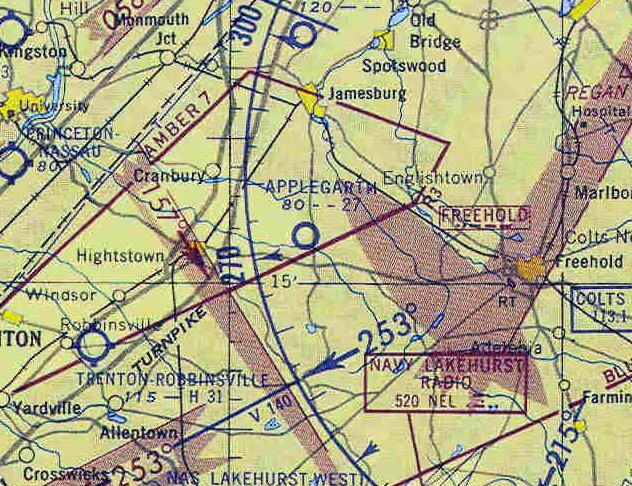 Applegarth Airfield, as depicted on the January 1955 NY Sectional Chart. 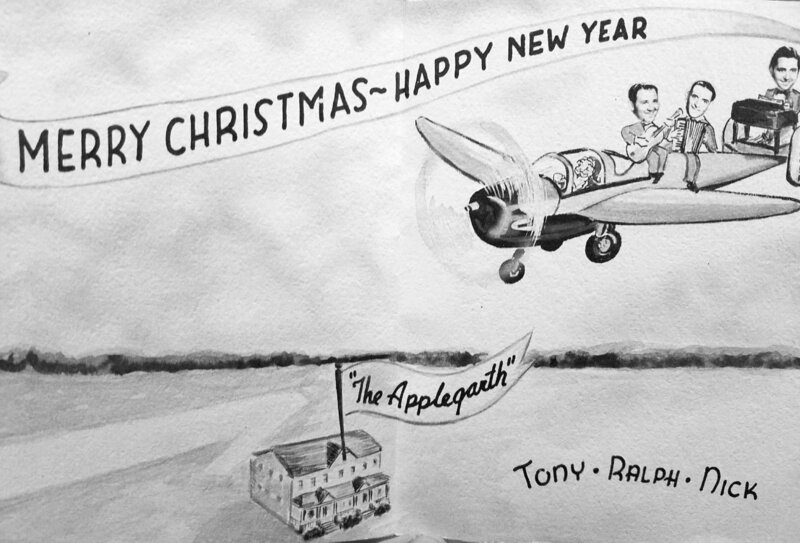 The Applegarth was a popular Italian restaurant, which boasted its own private airfield. as it was not yet depicted on the 1953 NY Local Aeronautial Chart (courtesy of Tim Zukas). Christina Alesi-Luis recalled, “Tony Lane aka Tony Alesi was my grandfather. He had a dirt runway behind his restaurant called the Applegarth Inn from the mid-1940s. which depicted it as having a 2,700' unpaved runway. A circa 1950s advertisement for the Applegarth Airfield (courtesy of Christina Alesi-Luis), showing the runway behind the restaurant. 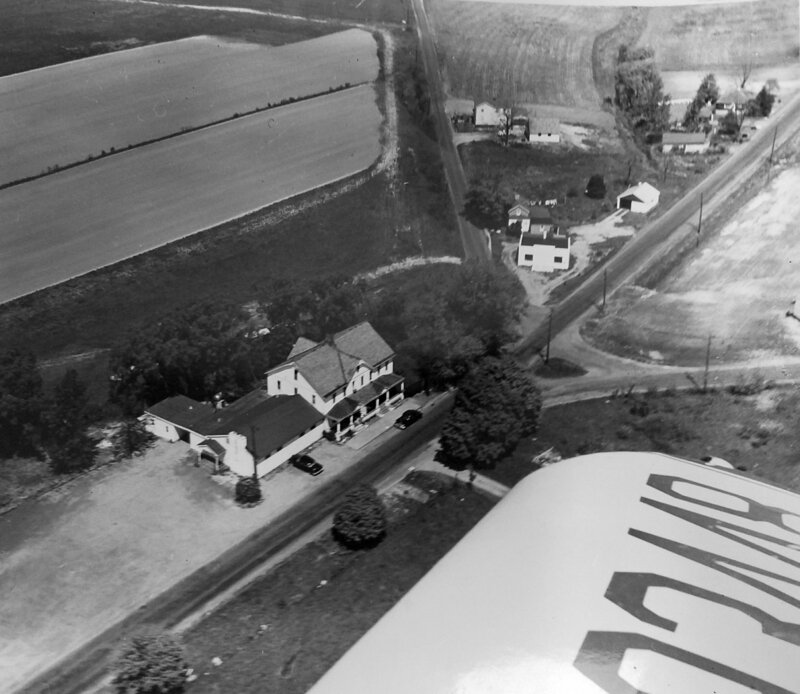 A circa 1950s aerial view looking northwest at the Applegarth restaurant (courtesy of Christina Alesi-Luis), showing the runway at the top-left. 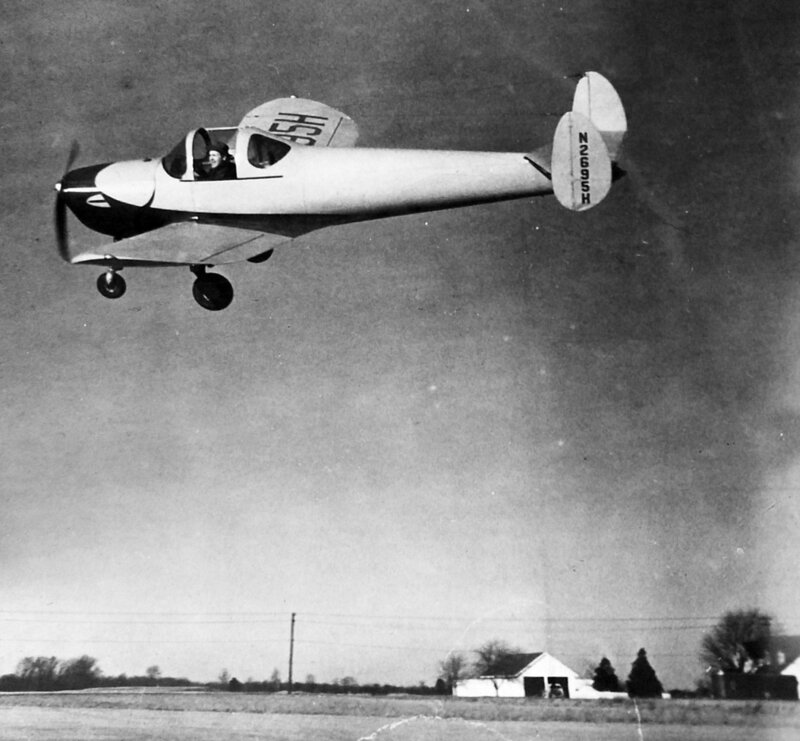 A circa 1950s photo of Tony Lane Alesi flying an Ercoupe over the Applegarth Airfield (courtesy of Christina Alesi-Luis). Amazingly his hat remains on his head in spite of the open canopy! 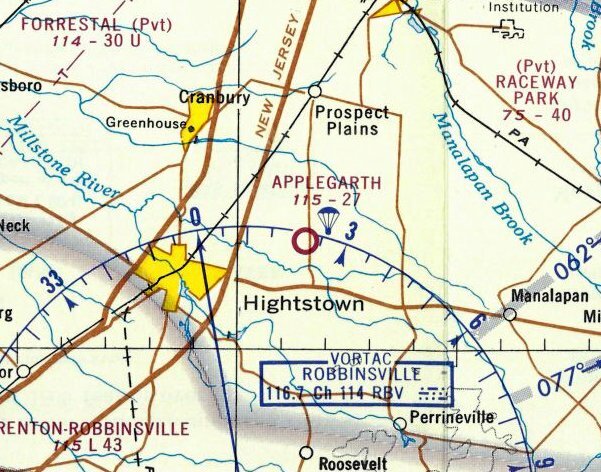 The 1961 NY Local Aeronautical Chart depicted Applegarth Airfield as having a 2,700' unpaved runway. which depicted it as having a 2,700' unpaved runway, and noted it as conducting parachute operations. 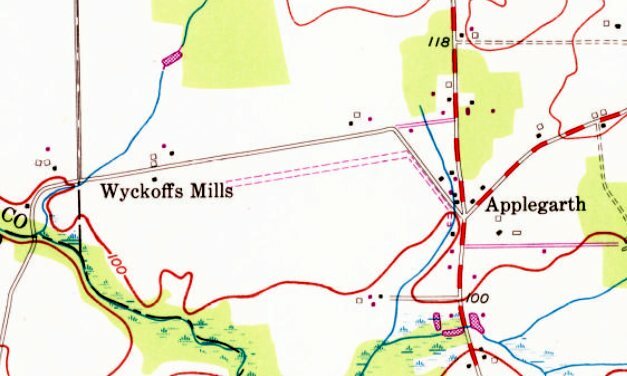 Applegarth Airfield, as depicted on the 1969 USGS topo map. A 11/30/69 USGS aerial view depicted a total of 4 light single-engine planes on Applegarth Airfield, which had a single unpaved northeast/southwest runway. According to Christina Alesi-Luis, her grandfather Tony Alesi owned the Applegarth until the late-1960s. 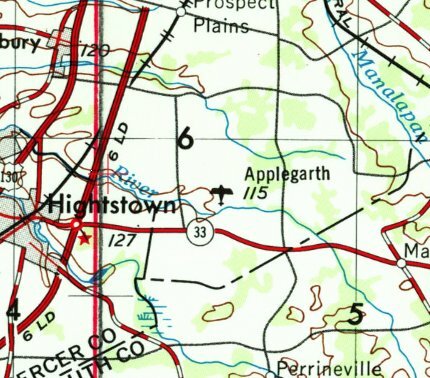 The 1970 USGS topo map still depicted Applegarth Airfield's unpaved northeast/southwest runway, but without any label. which depicted 2 light single-engine planes next to the runway. as it was no longer depicted on the 1972 NY Local Aeronautical Chart. 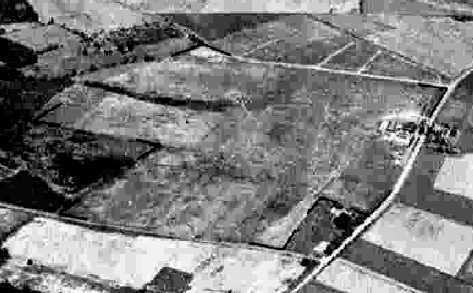 A 1979 aerial view showed no trace remaining of the Applegarth runway, with the land having been taken over by farming. A 2017 aerial photo did not show any trace of Applegarth Airfield. The site of Applegarth Airfield is located northwest of the intersection of Applegarth Road & Wyckoff Mills Applegarth Road. Thanks to Christina Alesi-Luis for pointing out this airfield. 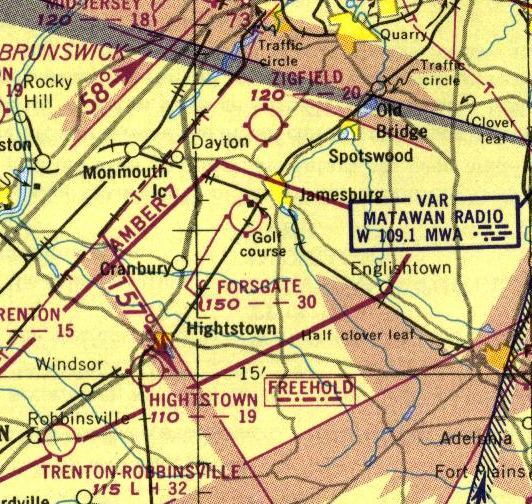 Hightstown Airport, as depicted on the 1934 NY Sectional Chart. Photo of the airport is not available. 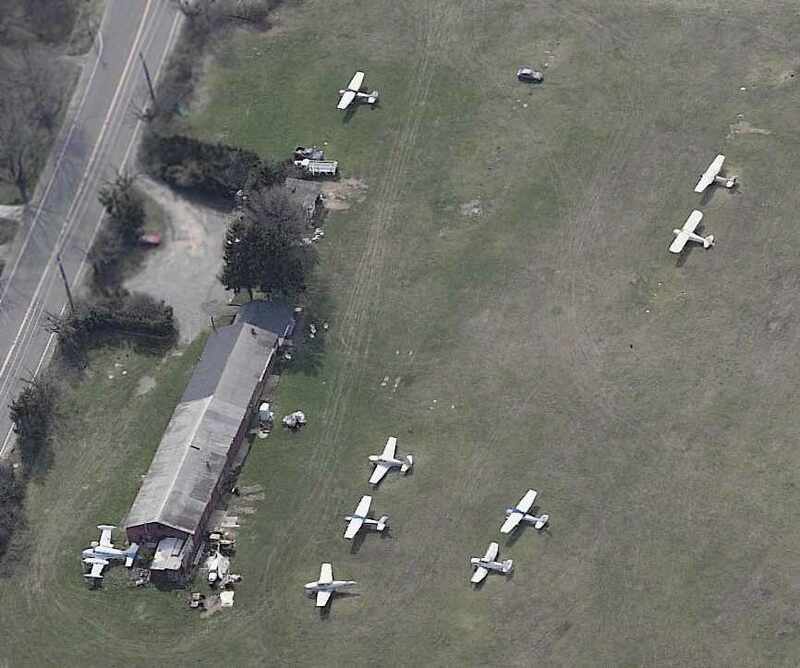 One of the huge number of New Jersey's general aviation airports lost to “progress”. The date of establishment of Hightstown Airport has not been determined. 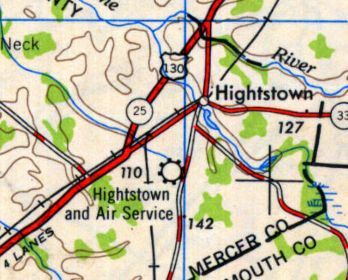 The earliest reference which has been located to Hightstown Airport was its listing in the Airport Directory Company's 1933 Airport Directory (according to Jim Stanton). which depicted Hightstown as a commercial/municipal airport. Hightstown Airport was not listed among active airports in the Airport Directory Company's 1937 Airport Directory (according to Jim Stanton). 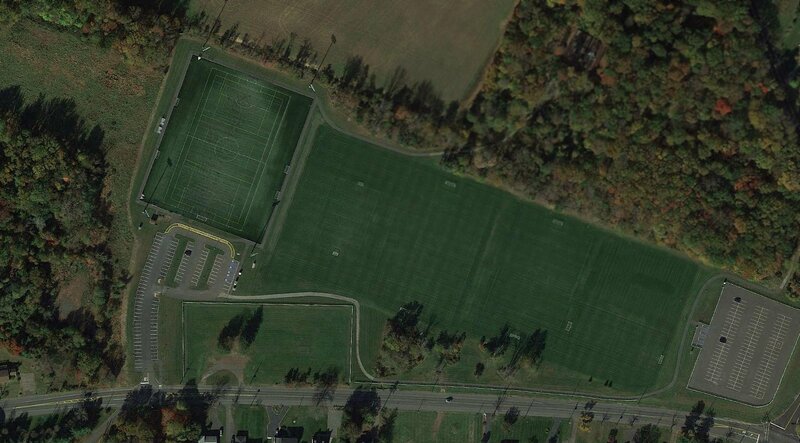 which depicted a grass field with a single hangar on the northwest corner. 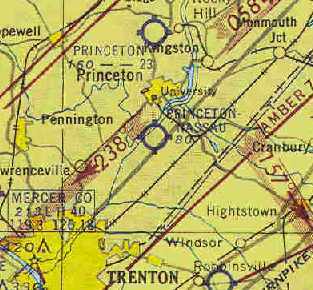 Hightstown Airport was not depicted on the March 1946 NY Sectional Chart (according to Jim Stanton). According to George Manser, the airport in Hightstown was also “known as Tony Lanes. 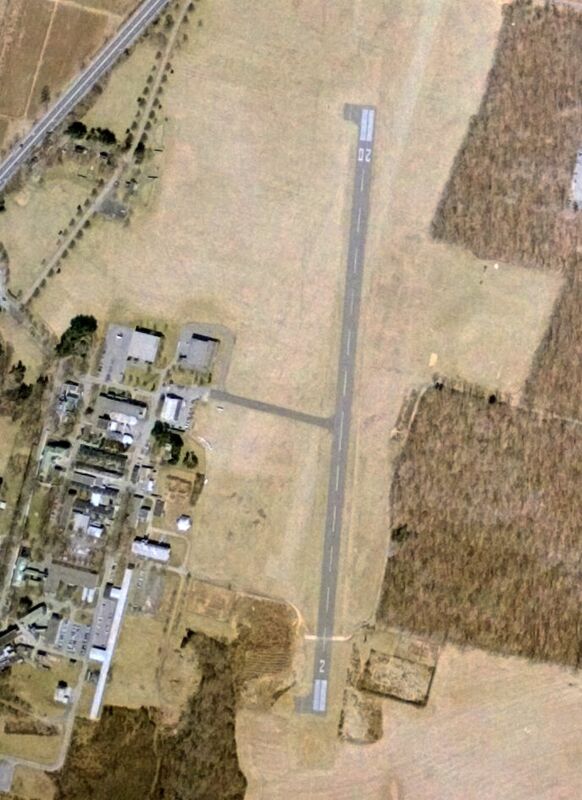 The only photo which has been located showing an aircraft at Hightstown Airport was a 1947 aerial view. It depicted one single-engine light aircraft parked next to the hangar on the northwest corner, which had a checkerboard-painted roof. 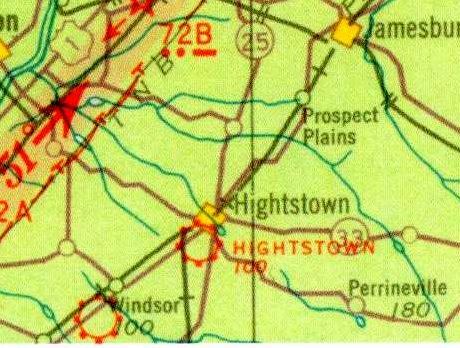 The 1949 USGS topo map depicted “Hightstown and Air Service” as a commercial/municipal airport. 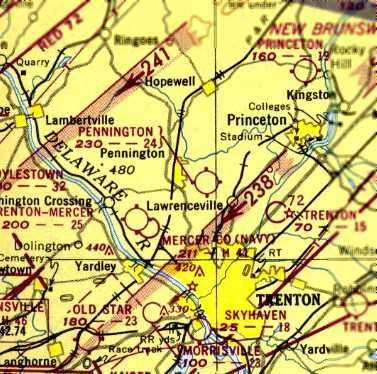 The last depiction which is available of Hightstown Airport was on the 1950 NY Sectional Chart. 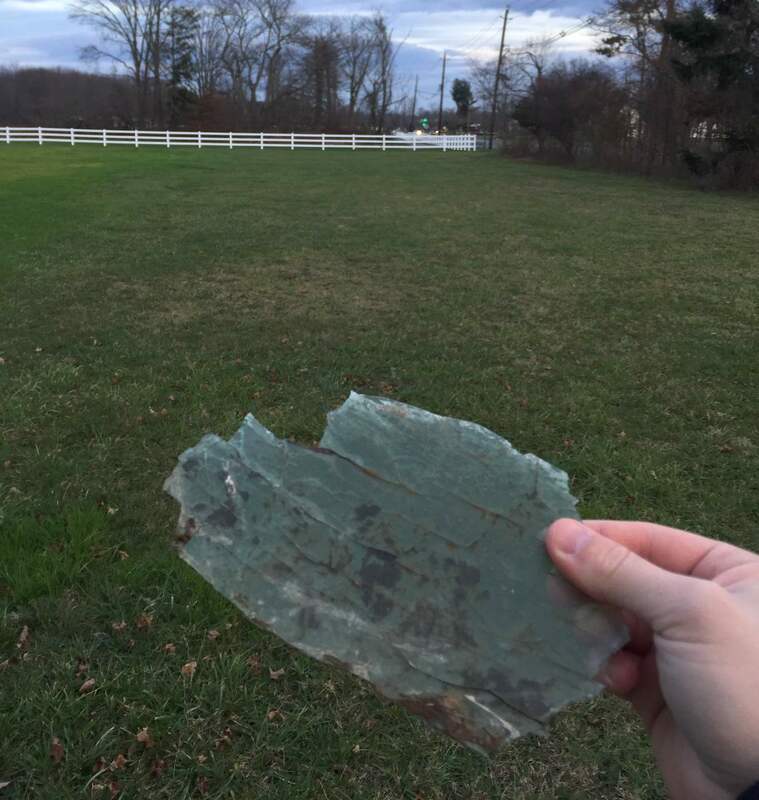 It depicted Hightstown as having a mere 1,900' unpaved runway. as a 1953 aerial photo depicted the oval racetrack of the East Windsor Speedway having been built over the eastern portion of the airport property. But the hangar remained standing on the northwest corner. 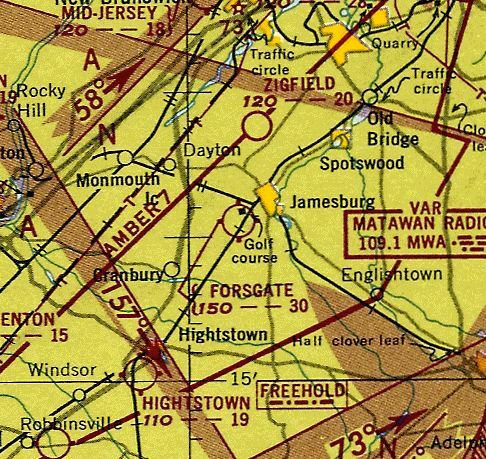 Hightstown Airport was no longer depicted on the 1957 NY Sectional Chart (courtesy of Mike Keefe). A 1957 aerial view continued to show the East Windsor Speedway on the east side, and the hangar remaining on the northwest corner of the former airport. A 1963 aerial photo showed the hangar had been removed at some point between 1957-63. A 1970 aerial photo showed the smaller East Windsor Speedway was replaced by a larger oval track on the southwest portion of the former airport property. 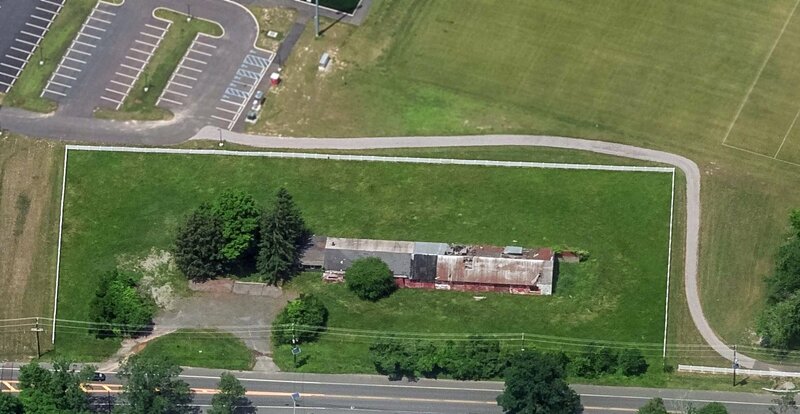 A 2008 aerial view showed the oval outline of the former East Windsor Speedway still remained on the property. 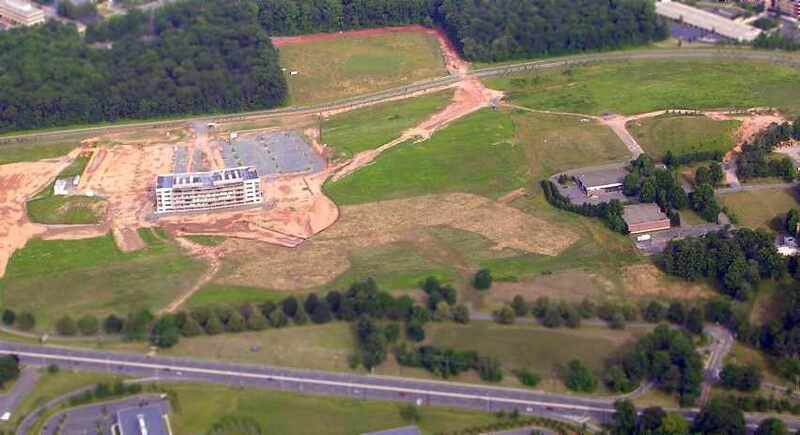 A 2010 aerial view showed housing construction covering the site of Hightstown Airport. 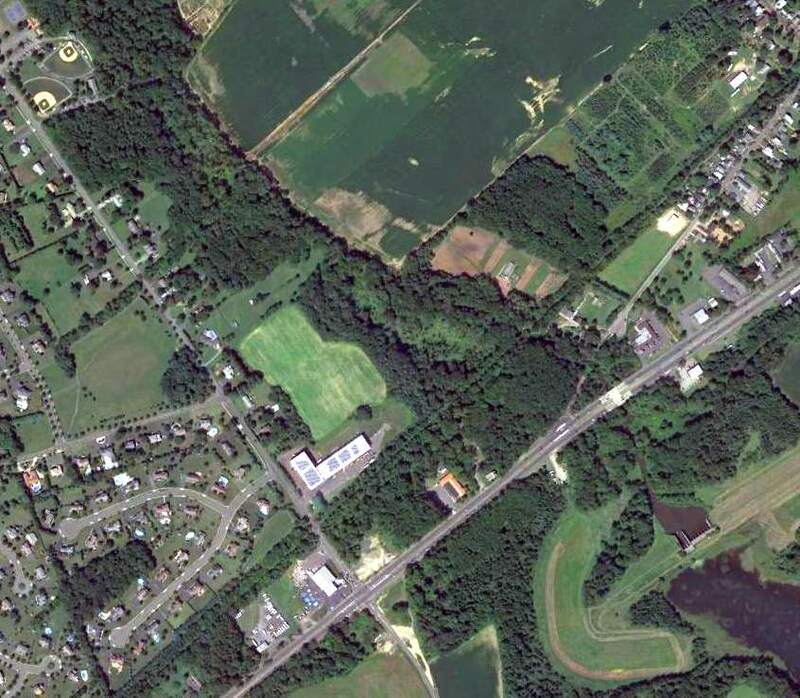 A 2016 aerial photo did not show any trace of Hightstown Airport. The site of Hightstown Airport was located south of the intersection of Endeavor Boulevard & Airport Road, appropriately enough. Thanks to George Manser for pointing out this airfield. 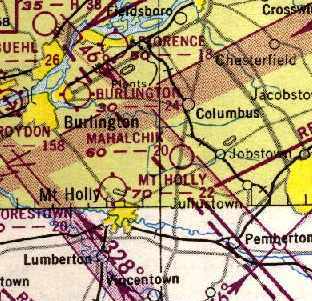 Windsor Airport, as depicted on the 1934 NY Sectional Chart (bottom-left airport symbol, just southwest of the town of Windsor). The date of establishment of Windsor Airport has not been determined. Windsor Airport was not yet listed among active airports in the Airport Directory Company's 1933 Airport Directory (according to Jim Stanton). which depicted Windsor as a commercial/municipal airport. 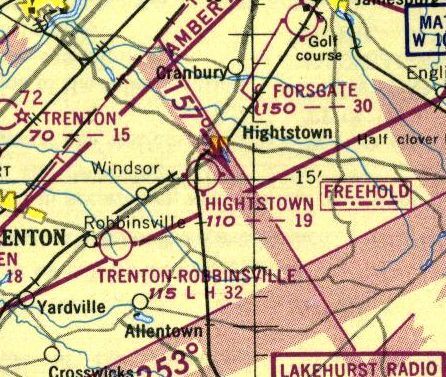 The directory described Hightstown-Windsor as a commercial airport located 3.5 miles southwest of Hightstown. 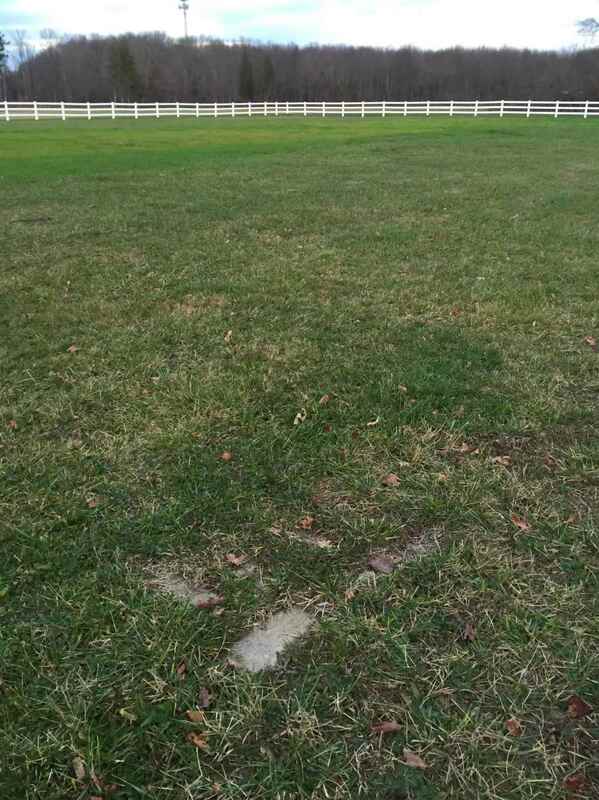 It was said to consist of a 2,200' x 1,500' rectangular sod field, with “Windsor” painted on the hangar. The directory also listed it under the name of Central Jersey Airport. 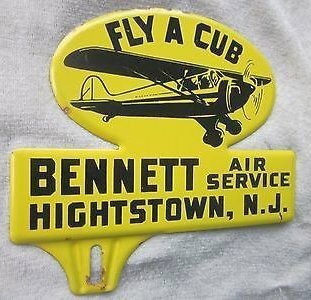 A circa 1930s sign promoting Bennett Air Service, Hightstown NJ (courtesy of Ed Drury). According to Jim Stanton, “Al Bennett was known as the 'world's greatest airplane salesman' during that period. 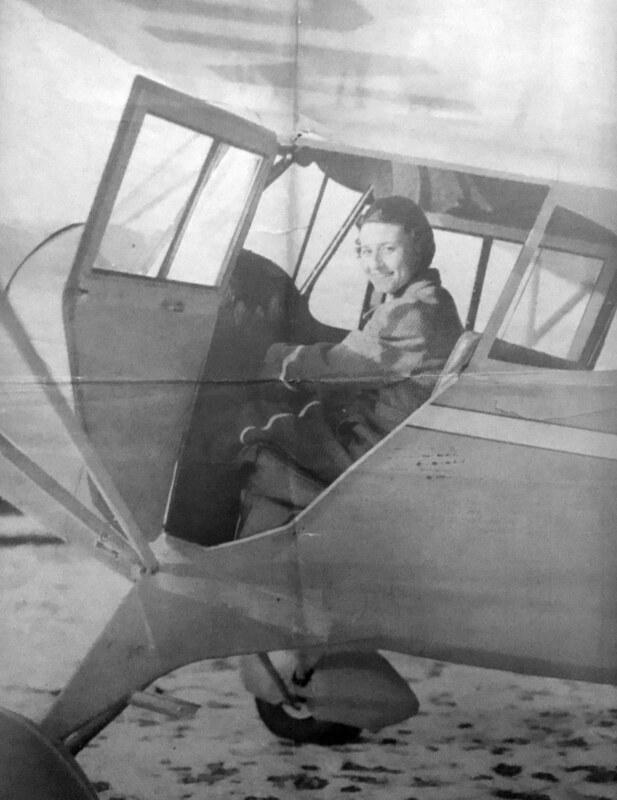 An undated photo from a 3/10/40 article of Lida Dey DeRoche inside an unidentified plane at Central Jersey Airport (courtesy of Brenda MacMurray). 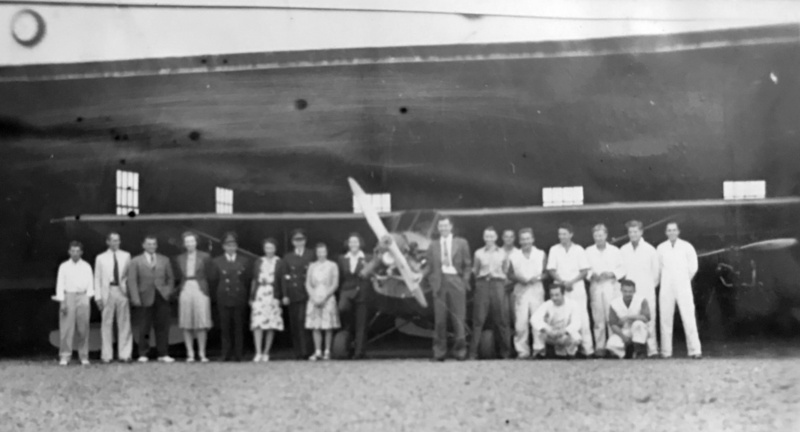 An undated (circa 1940) photo of an unidentified group in front of several aircraft inside a Central Jersey Airport hangar (courtesy of Brenda MacMurray). 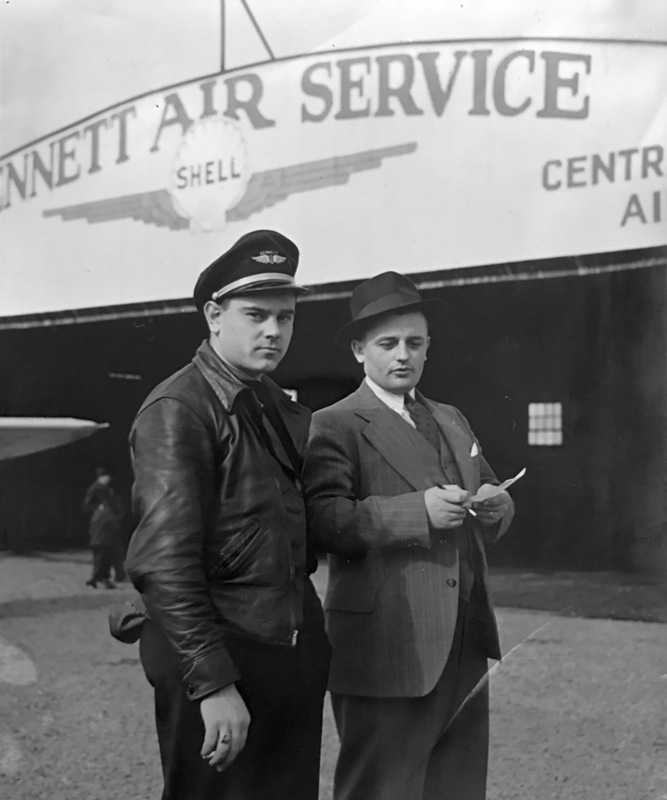 An undated (circa 1940) photo of 2 men in front of Central Jersey Airport's Bennett Air Service hangar (courtesy of Brenda MacMurray). was on the November 1942 NY Sectional Chart (courtesy of Ron Plante). It depicted Central Jersey as a commercial/municipal airport. Windsor Airport was no longer depicted on the January 1945 NY Sectional Chart (courtesy of Ron Plante) or subsequent charts. 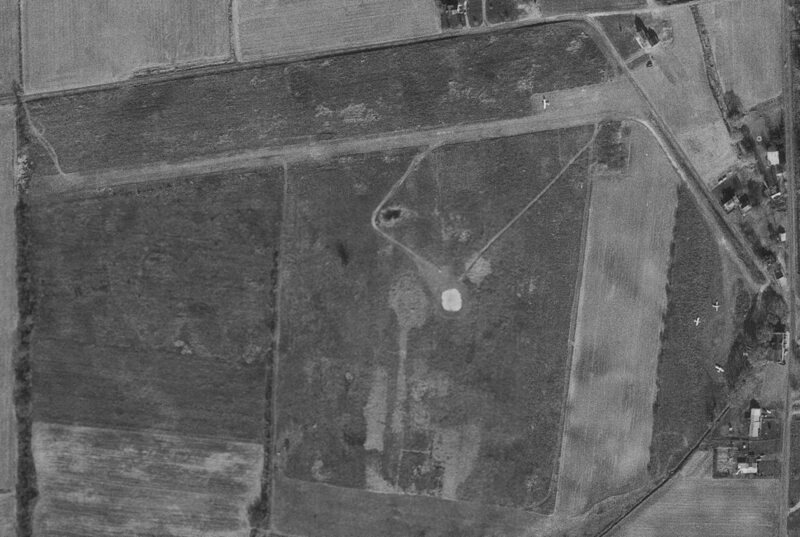 A 1947 aerial view did not show any recognizable indication of an airport, just what appeared to be farm fields. Jim Stanton reported, “I drove by the location many times. I believe the first time was around 1962. 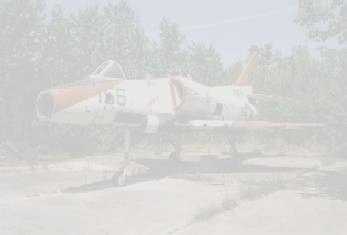 A NJ historian confirmed that the hangar was still there when he moved to the area around 1970. A 2013 aerial photo did not show any trace of Windsor Airport. it was located approximately west of the terminus of South Main Street. Forsgate Airpark, as depicted on the 1948 USGS topo map. 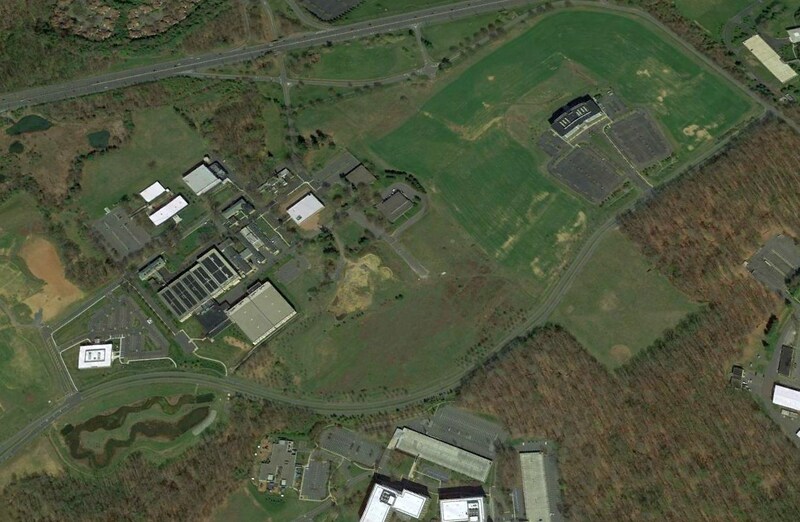 Yet another of New Jersey's disproportionate share of small airfields lost to “progress”. According to the 1/15/47 Trenton Evening Times (courtesy of Mark Hess), Forsgate opened on 2/1/47. despite the public outcry that air travel would hurt agricultural productivity. It was said that the noises and fumes of the planes were sure to ruin egg production & cause stillborn calves. But Abeel built anyway, dispelling the community’s fears & creating a fliers’ Mecca. 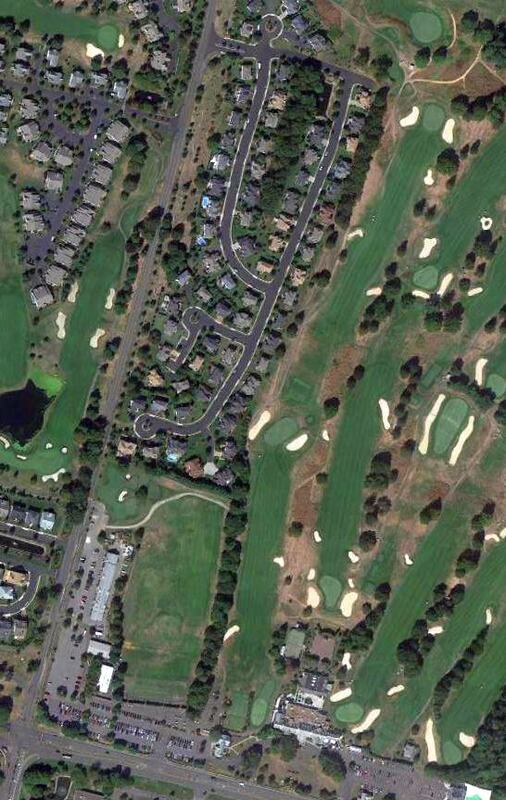 Small private planes would cruise over the beautiful Charles Banks golf course & land on the green sod runways. where for 75 cents he could eat a hearty breakfast, or order a mouth-watering dinner for $1.25. adjacent to the west side of its golf course. which depicted Forsgate as a municipal/commercial airport. The earliest aeronautical chart depiction which has been located of Forsgate Airpark was on the July 1949 Sectional Chart (courtesy of Ron Plante). 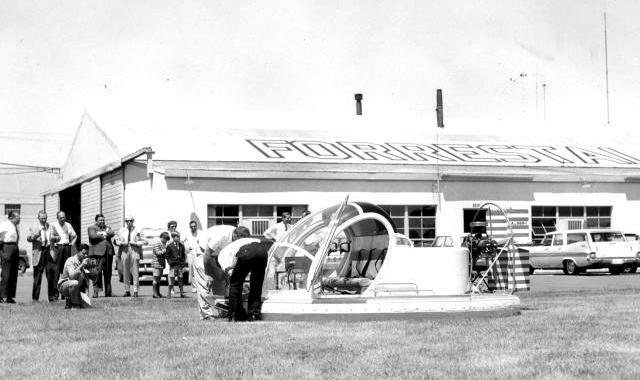 It depicted Forsgate as having a 3,000' unpaved runway. with the farm buildings & dairy in the background (courtesy of Thomas Saunders, Golf Course Superintendent of Forsgate Country Club). The last aeronautical chart depiction which has been located of Forsgate Airpark was on the 1950 Sectional Chart (courtesy of Mike Keefe). George Manser recalled, “It was a favorite of the elites as they would flying in for the days with fine dining & other luxuries. The 1953 USGS topo map depicted Forsgate Country Club but did not depict Forsgate Airpark. as it was no longer depicted on the 1957 Sectional Chart (courtesy of Mike Keefe). 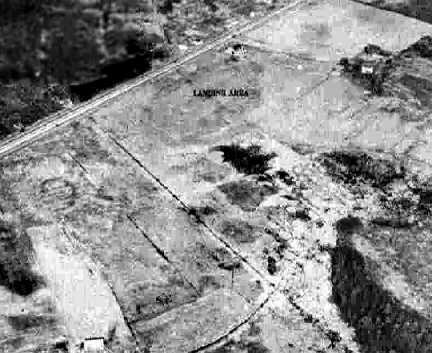 A 1957 aerial photo depicted the presumed grass runway remained clear. A 1963 aerial photo showed the golf course had expanded over the location of Forsgate Airpark. A 9/20/10 aerial photo did not show any trace of Forsgate Airpark, with the site having been covered with houses & other buildings. The site of Forsgate Airpark is located northeast of the intersection of Links Drive & Forsgate Drive. 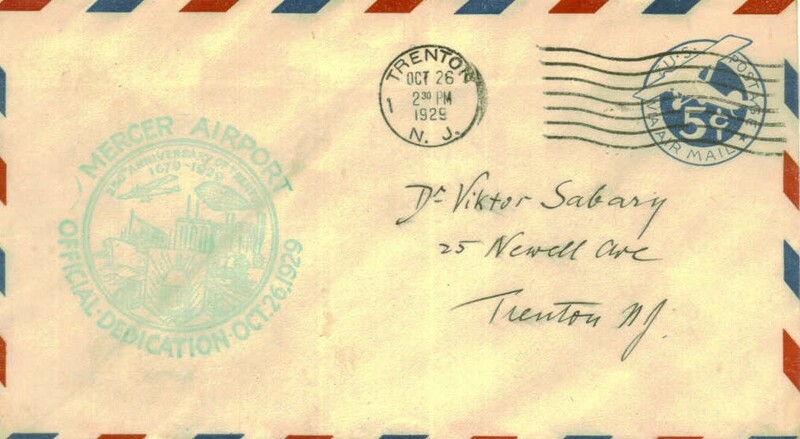 A postmark commemorated the 10/26/29 Dedication of Trenton Mercer Airport (courtesy of the Hamilton Historical Society, via Mark Hess). The original Mercer County Airport was located adjacent to the northwest side of the present-day Mercer County Airport. 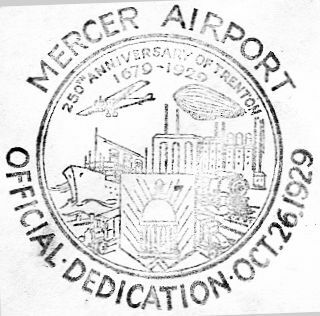 A postmark commemorated the 10/26/29 Dedication of Trenton Mercer Airport. The earliest depiction which has been located of Mercer Airport was a 1930 aerial view. 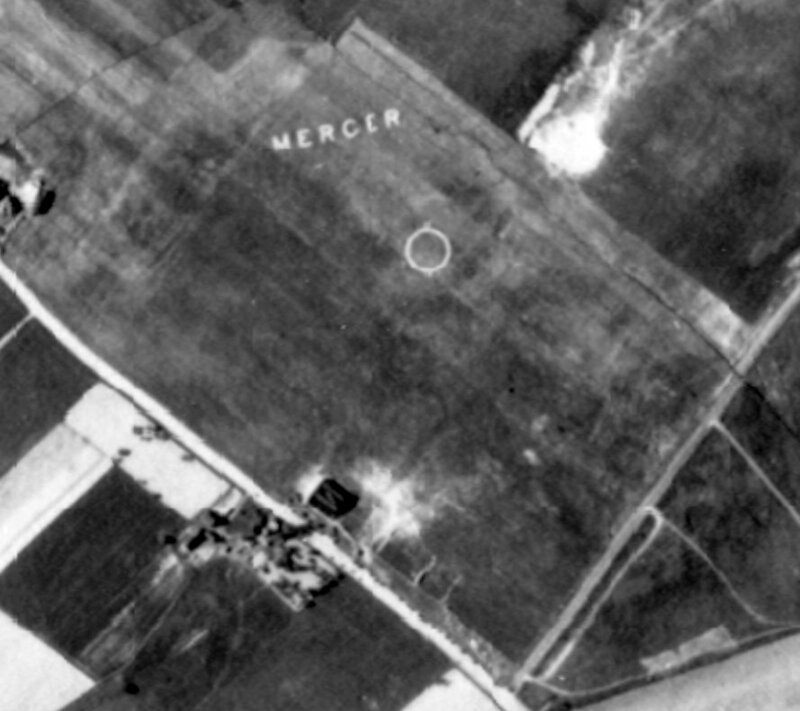 an airport circle marking in the center of the field, and the word “Mercer” prominently written in the grass along the northern edge. An undated photo from the 1/3/31 Trenton Advertiser (courtesy of Tony Richardson) depicted 3 Keystone amphibians in front of the Mercer Airport hangar. It was captioned “Air yachts from Keystone plant fill Mercer Airport hangar to capacity. A closeup from the 8/18/31 aerial view looking north at the Mercer hangar, showing 2 aircraft in front of the hangar. with large numbers of aircraft & spectators on the field (courtesy of the Hamilton Historical Society, via Mark Hess). from a circa late 1930s Airfield Directory Company Airfield Directory (courtesy of the Hamilton Historical Society, via Mark Hess). A 6/21/41 aerial view looking south at “Mercer County Airport (Old)” from the 1945 AAF Airfield Directory (courtesy of Bob Rambo). It depicted the “Mercer County Airport (Old)” as an open grass field with some small buildings on the west side. which depicted it as a commercial/municipal airport. having 2 sod runways, measuring 2,500' northeast/southwest & 2,400' east/west. The field was said to have 3 hangars, the largest of which was a 120' x 40' metal structure. Mercer County Airport was described as being owned by private interests, but “Not in operation”. It may have been temporarily closed during WW2, like many other small civilian airports. presumably due to its closure during WW2. 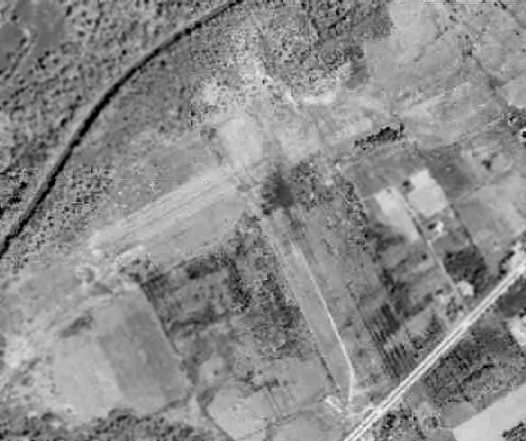 The last photos which have been located of the original Mercer Airport included a circa 1946-49 aerial view looking west by CAP Sgt. W. Egge (courtesy of Bruce Reid). It depicted a dozen light aircraft parked to the northwest of the hangars. 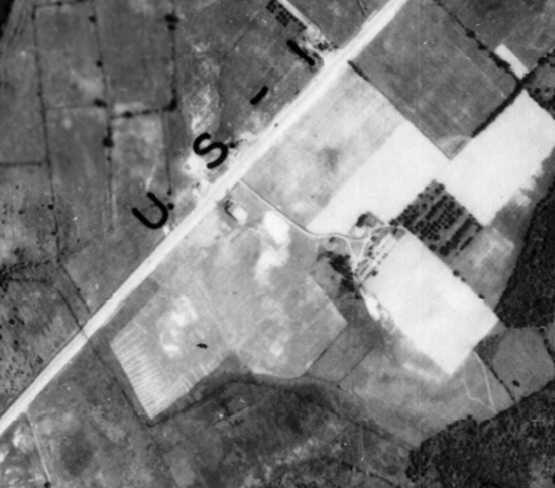 The last photos which have been located of the original Mercer Airport included a circa 1946-49 aerial view looking east by CAP Sgt. W. Egge (courtesy of Bruce Reid). Michael Darling reported, “Mercer Airport in Trenton was a small grass strip run by my grandfather [James Darling] in the 1940s – 50s. 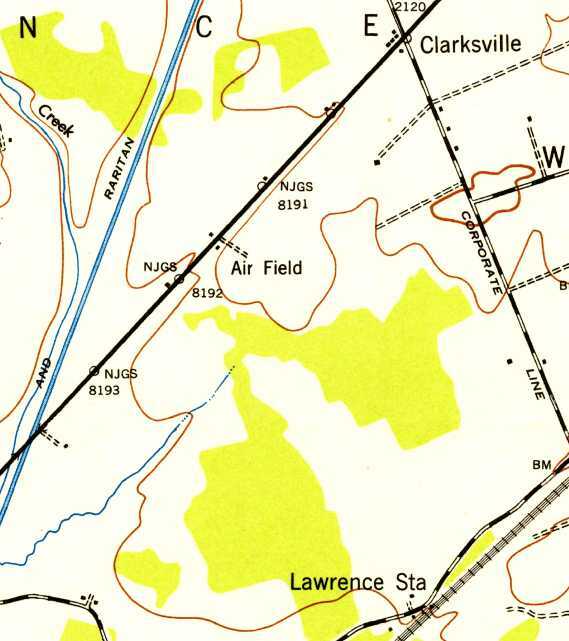 Mercer County Airport, as depicted on the 1947 USGS topo map. 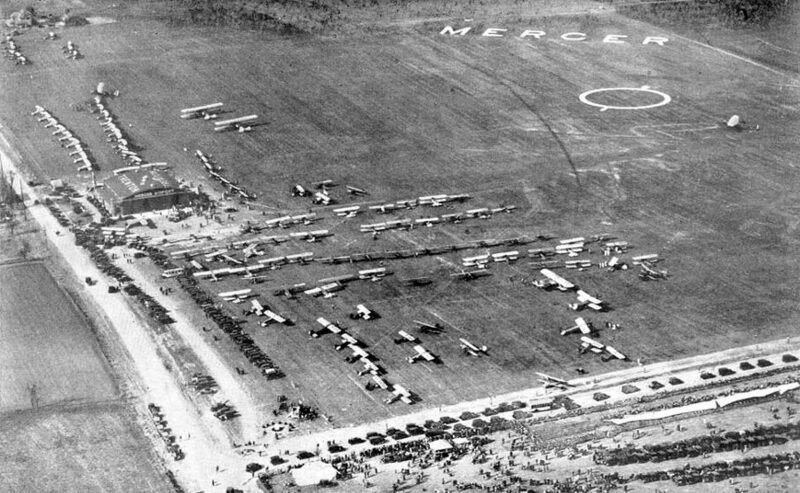 A 1947 aerial photo depicted several light aircraft parked along the west side of the original Mercer County Airport. The original Mercer County Airport was once again depicted on the July 1949 NY Sectional Chart (courtesy of Ron Plante). 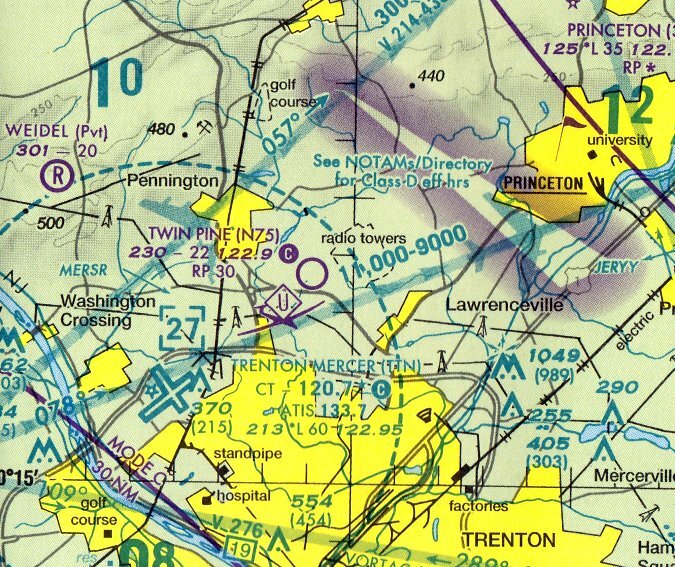 which depicted “Trenton-Mercer” as having a 2,500' unpaved runway. 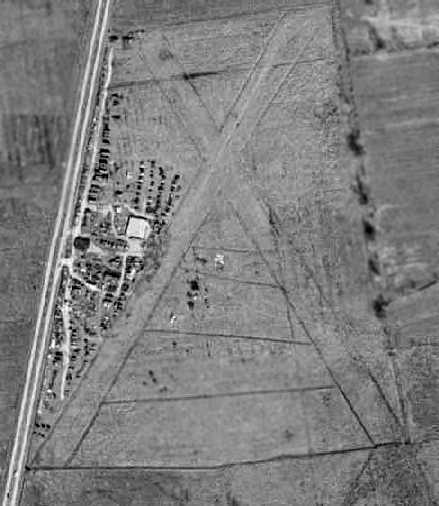 as a 1953 aerial view showed a closed “X” symbol added over the circle marking in the center of the airfield. but the field was devoid of aircraft. 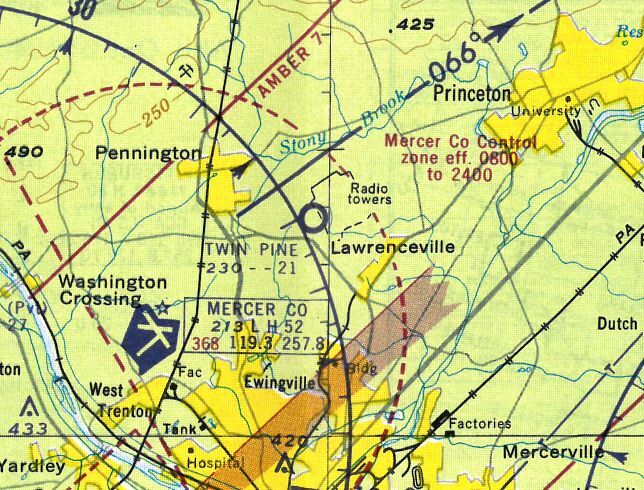 The last depiction which has been located of the original Mercer Airport was on a 1956 Mercer County map (courtesy of Micheal Darling). but several new roads had been built across the former airfield. 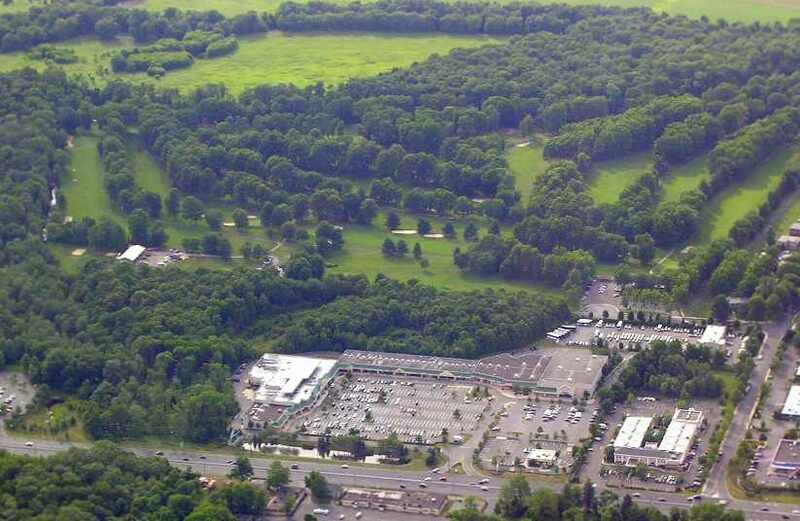 A 1958 aerial view showed that a golf course had begun to be constructed over the majority of the site of the original Mercer County Airport. 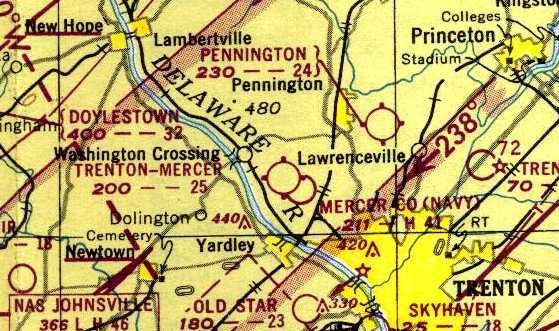 The original Mercer County Airport was no longer depicted on the July 1961 Philadelphia Local Aeronautical Chart (courtesy of Tim Zukas). A 1979 aerial view showed the complex of hangars & buildings on the west side of the original Mercer County Airport remained intact. 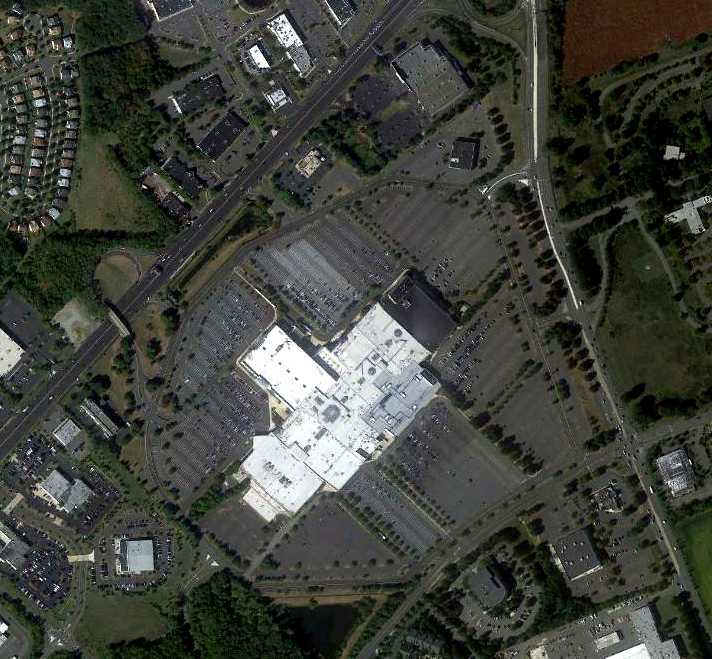 as a 1995 aerial view showed several new office buildings having been built on the site. 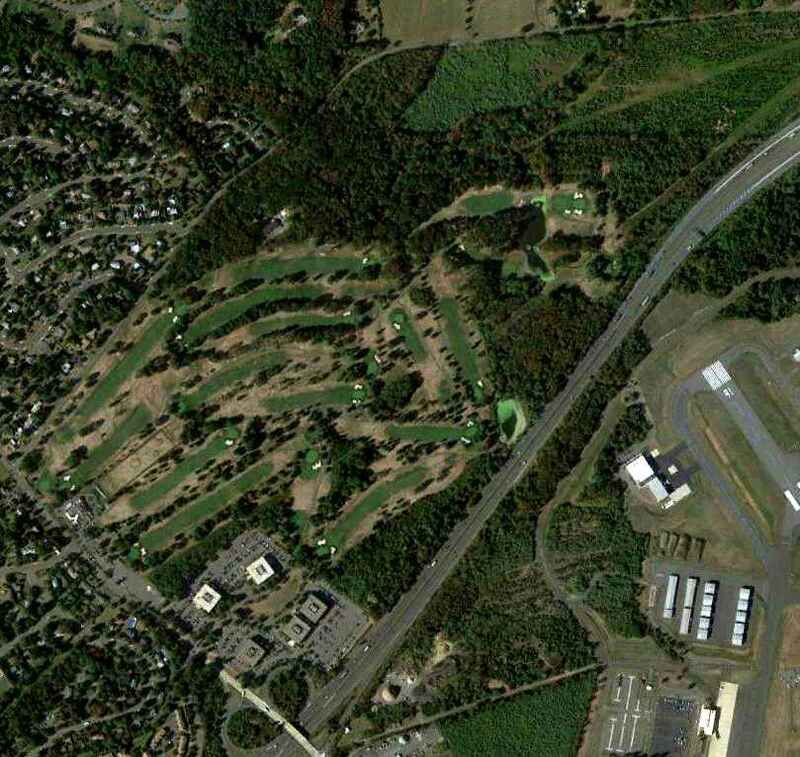 A 9/21/10 aerial photo did not show any trace of the original Mercer County Airport, with a golf course covering the site. 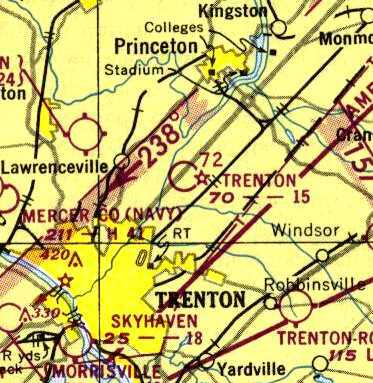 Note the runways of Trenton-Mercer Airport, immediately adjacent to the southeast. adjacent to the northwest side of Trenton-Mercer Airport. An undated photo of the Trenton-Princeton Airport's original hangar, from a 10/27/29 article (courtesy of Dennis Waters). 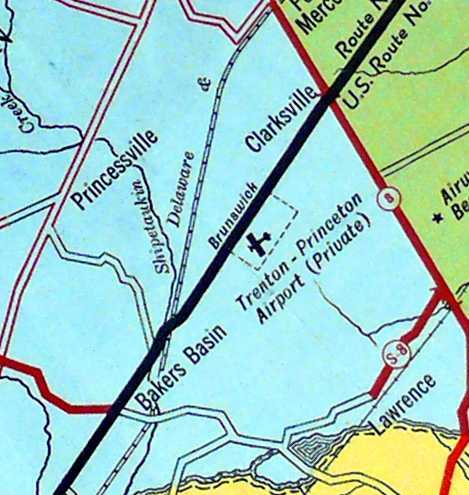 This small airport was located on the northeast side of Trenton. “The Trenton-Princeton Airport Inc. was granted permission to construct a flying field on the Seely-Rostron Farms, Lawrence Township. According to Dennis Waters, “Plans for the new 'Trenton-Princeton Airport' were revealed in early 1929. The organizers of the venture were two executives from the Hun School, Edward Stevens & Robert Lechner, and Joseph Wetzel, a well-known mechanic from Trenton. Later that year the trio constructed their airfield & hangar on a strip of land along Brunswick Pike that had been part of the Seely-Rostron farm. It comprised two 1,500' sod runways oriented north/south & east/west. Tom Kramer reported, “In 1978 I was working for the state of NJ with a geodetic survey crew. We had drawings of each point in the state & it's location to telephone poles, curbs & other buildings. Lo & behold, there was a point located at the corner of a hangar at the Trenton Airport, but not the current one (TTN) or even the one that it replaced. It was the one on Route 1. The drawing was dated around 1929.
was an undated photo of its original hangar from a 10/27/29 article (courtesy of Dennis Waters). 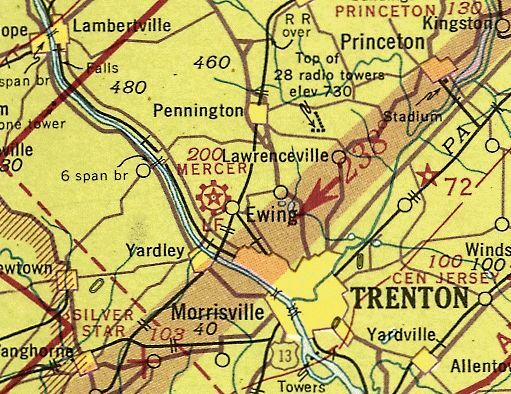 The Trenton-Princeton Airport, as depicted on a 1930 Township Plan for Lawrence Township (courtesy of Dennis Waters). was a 1930 aerial view (from the NJ Geographic Information Network, courtesy of Dennis Waters). A single newly-constructed hangar is visible just below the “US-1” label. 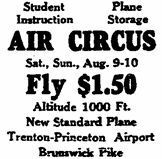 An advertisement for an 8/9/30 Air Circus at Trenton-Princeton Airport from the 8/8/30 Trenton Evening Times (courtesy of Dennis Waters). was a 1932 Mercer County Map (courtesy of Dennis Waters). 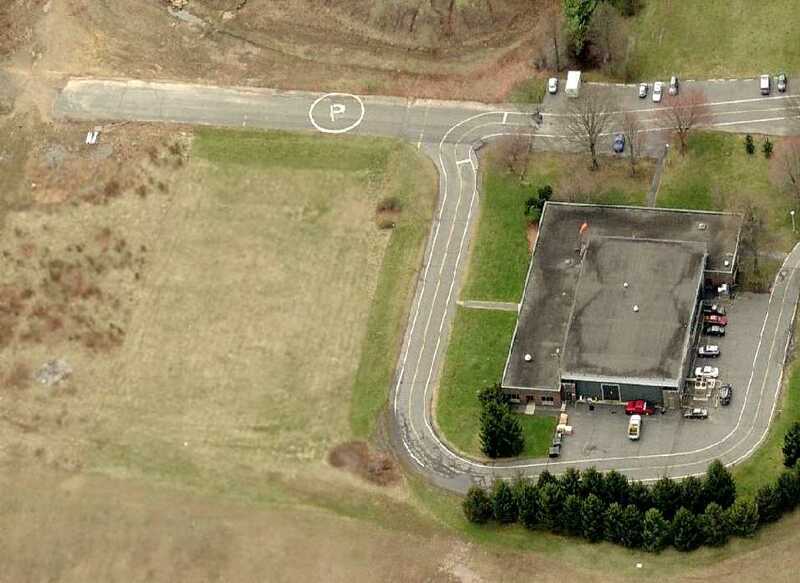 It also denoted an Airway Beacon a short distance to the east, on the opposite side of Route 8.
and operated as an airport & firefighting vehicle repair shop” starting in 1940. 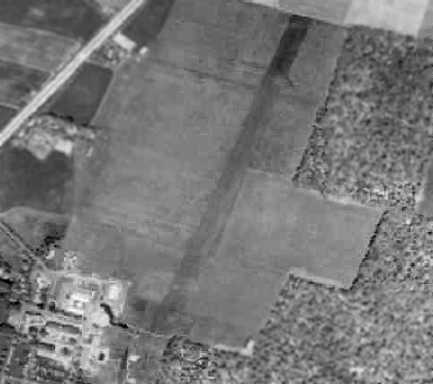 A 1940 aerial photo showed the hangar on the north side of the field had been painted with a checkerboard pattern at some point between 1930-40. 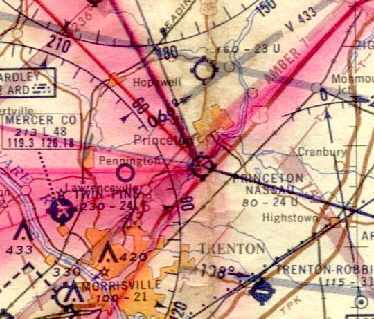 However, the Trenton Airport on the northeast side of the town was not yet depicted on the March 1940 NY Sectional Chart. According to Dennis Waters, “In 1941 it was taken over by Plainsboro farmer Isaac Barlow, who established the 'Isaac Barlow & Son Aircraft Division' there. Barlow’s son Edward owned farmland adjacent to the airport. with a hangar in the background with “Trenton Airport” & a checkerboard pattern on the roof. 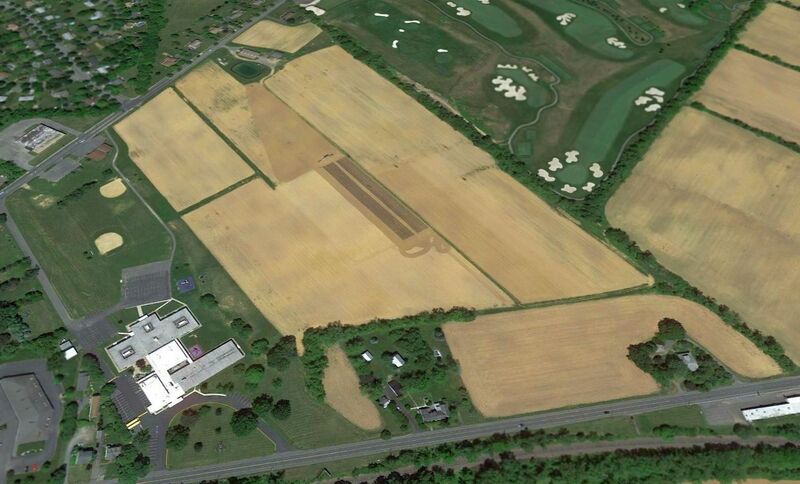 depicted “Trenton Airport” as consisting of a grass field with a single hangar. having two 1,500' sod runways, oriented north/south & east/west, and a single 80' x 60' hangar. 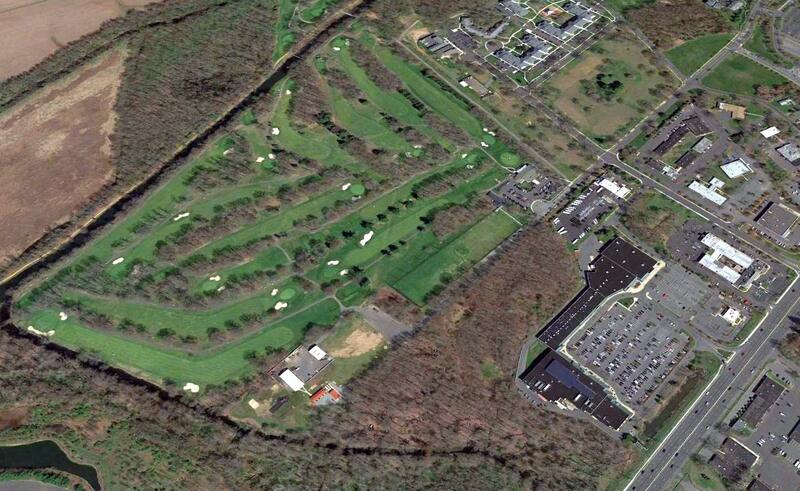 Trenton Airport was described as being owned by the State of NJ, and operated by the State of NJ Forest Fire Service. 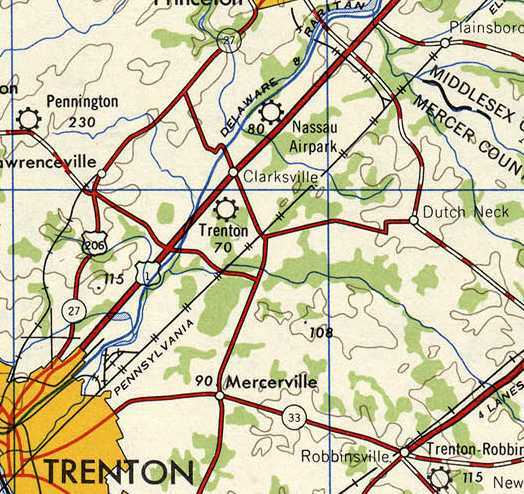 which depicted “Trenton” as an auxiliary airfield. 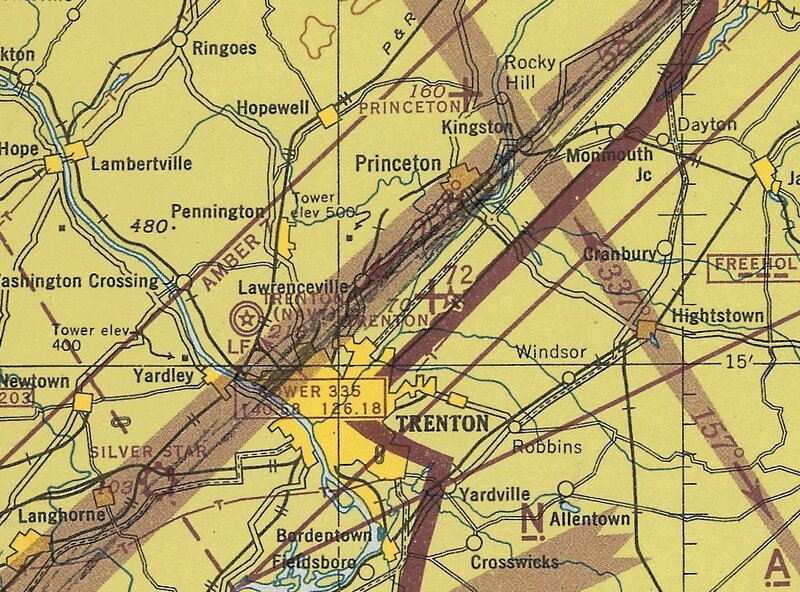 The 1947 USGS topo map labeled the airport simply as “Trenton”. 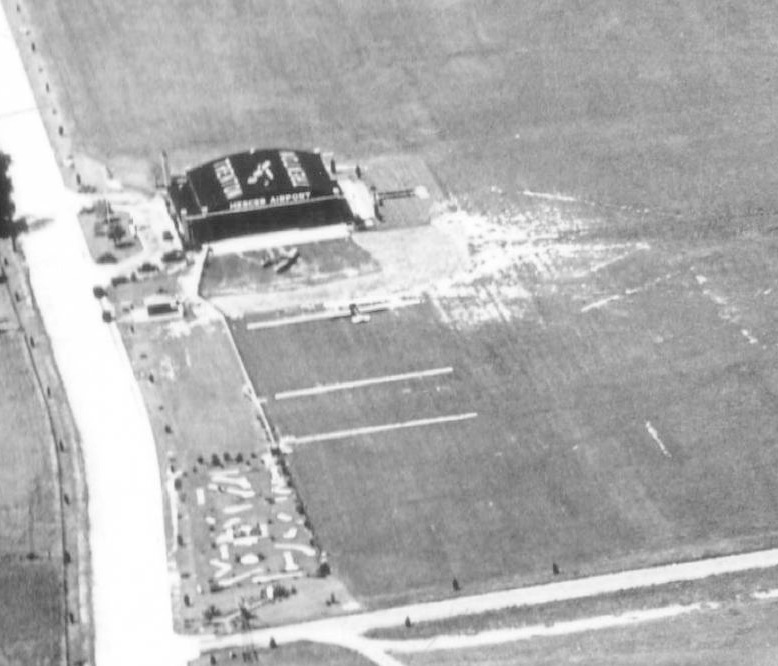 A 1947 aerial photo showed the hangar on the north side of the field still had a checkerboard pattern on its roof. 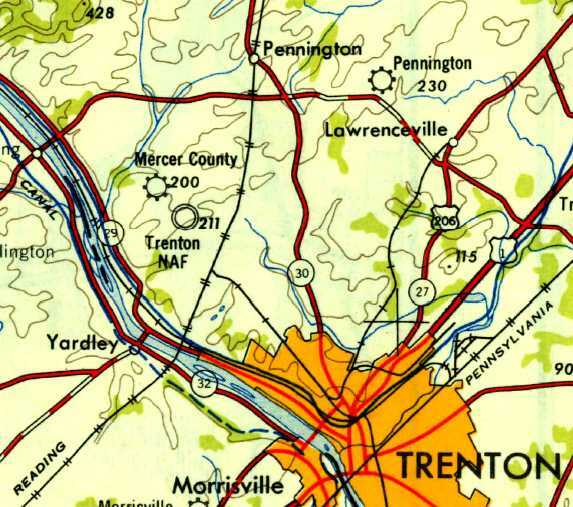 which depicted “Trenton” as having a 1,500' unpaved runway. 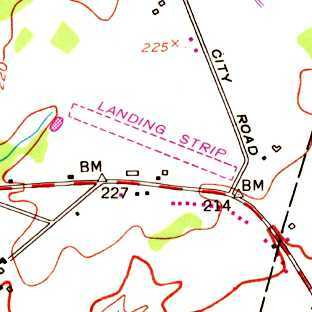 The 1952 USGS topo map simply labeled the site as “Air Field”, but only depicted one small building, and no other airfield layout. According to Tony Richardson, a hangar on this property was visible in a 1953 aerial photo. According to Dennis Waters, “Until the mid-1950s, the state used the field as a base for spotter planes of the NJ Forest Fire Service. 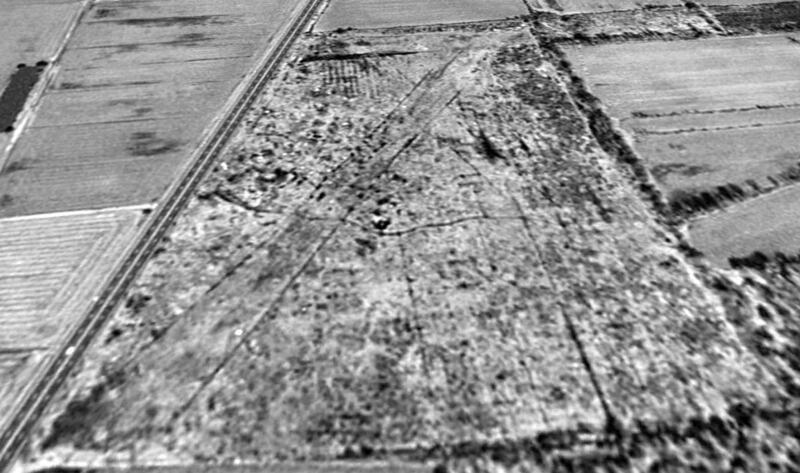 A 1953 aerial photo showed the hangar on the north side of the field remained standing, but the field appeared abandoned. 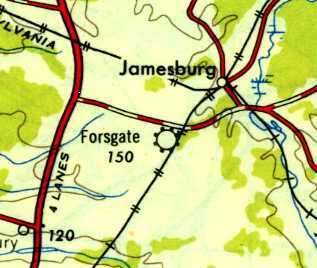 A 1954 road map (courtesy of Dennis Waters) no longer depicted an airfield at the site. According to Tony Richardson, the operation of Trenton Airport by the Forest Fire Service ended in 1956. 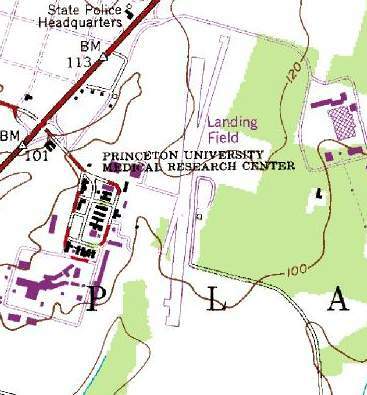 The 1956 USGS topo map no longer depicted an airfield at the site. A 9/21/10 aerial photo did not show any trace of the Trenton Airport. 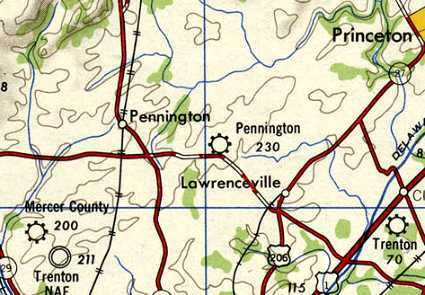 Pennington Airport, as depicted on the 1947 USGS topo map. Yet another privately-owned general aviation airport lost to a municipal government's desire to appropriate the property for other uses. and it was not listed among active airfields in the 1945 AAF Airfield Directory (courtesy of Scott Murdock). 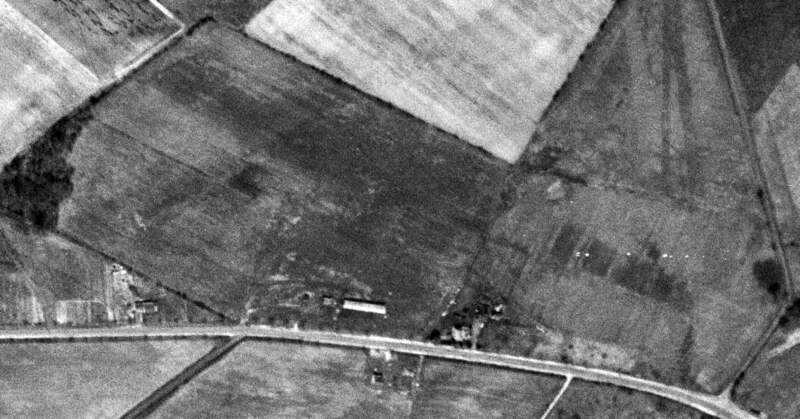 Nothing was yet depicted at this location on a 1940 aerial photo. but this has not been substantiated. 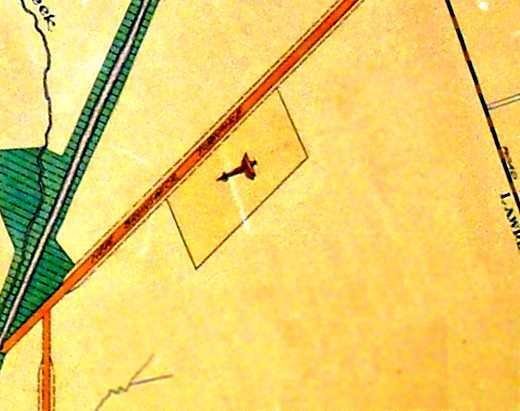 The earliest depiction which has been located of the Pennington Airport was on the 1947 topo map. 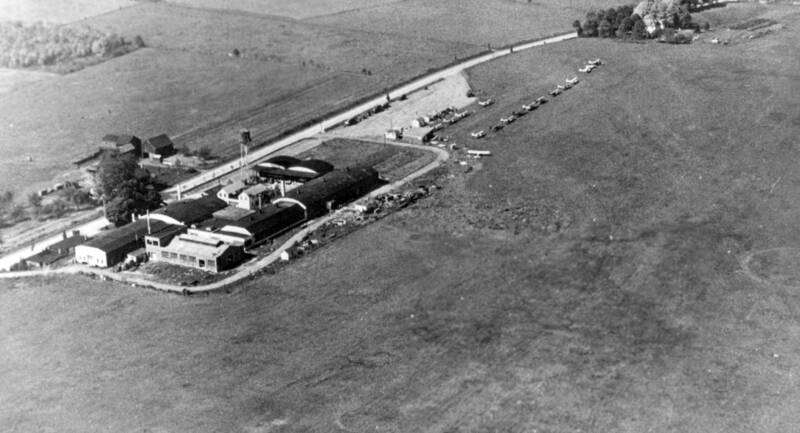 The earliest photo which has been located of the Pennington Airport was a 1947 aerial view. It depicted the field as having a single east/west grass runway, with several small buildings & 4 single-engine aircraft on the south side. was on the 1950 NY Sectional Chart (courtesy of Mike Keefe). It depicted Pennington as having a 2,400' unpaved runway. which did not depict a single aircraft. as it was no longer depicted on the 1955 NY Sectional Chart. The airport was purchased by William Weasner in 1956. According to Weasner's obituary, “The airport was his life. 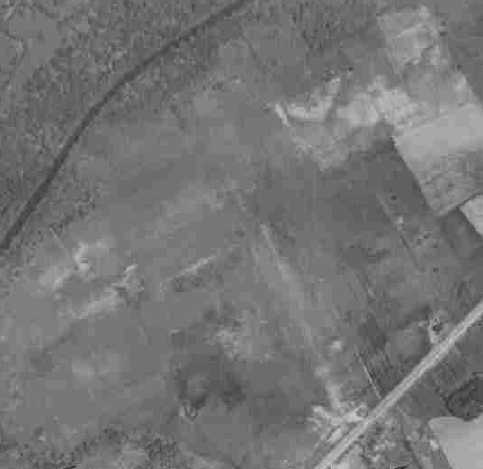 A 1957 aerial photo of Pennington Airport only depicted one aircraft on the field. airport owner William Weisner complained that Hopewell Township's interference made it difficult for his airport to survive economically. In 1957, the Township restricted him to having only 3 aircraft on the field. “As a kid I remember planes lined up close to the road. Quite a few all different sizes. 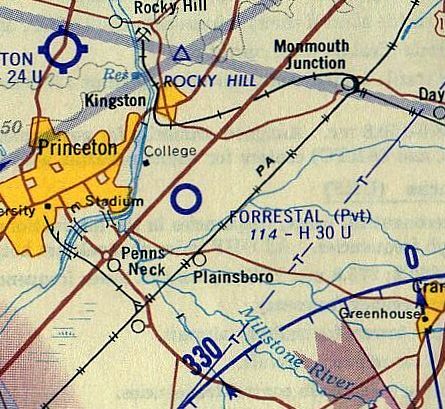 Pennington Airport was not depicted on the 1958 NY Sectional Chart. 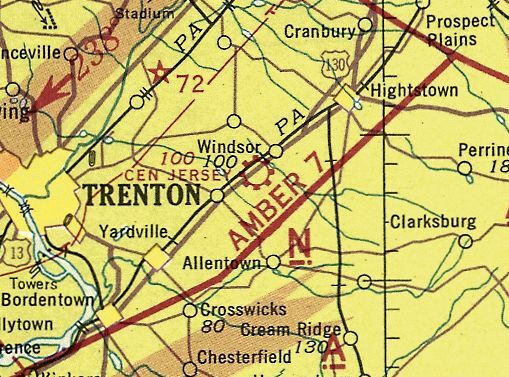 as Twin Pine Airport was depicted on the July 1961 Philadelphia Local Aeronautical Chart (courtesy of Tim Zukas) with a 2,100' unpaved runway. A 1960s photo of Michael Rovello in his restored Pitts Special aerobatic biplane at Twin Pine Airport. Michael Rovello recalled, “I was taught to fly at Twin Pine Airport by a former Navy instructor named Walt Fawcett in 1962. I subsequently became a flight instructor & taught flying at Twin Pine until the airport closed. a Pitts Special, and a Bucher Jungmann - which is now in an English museum. 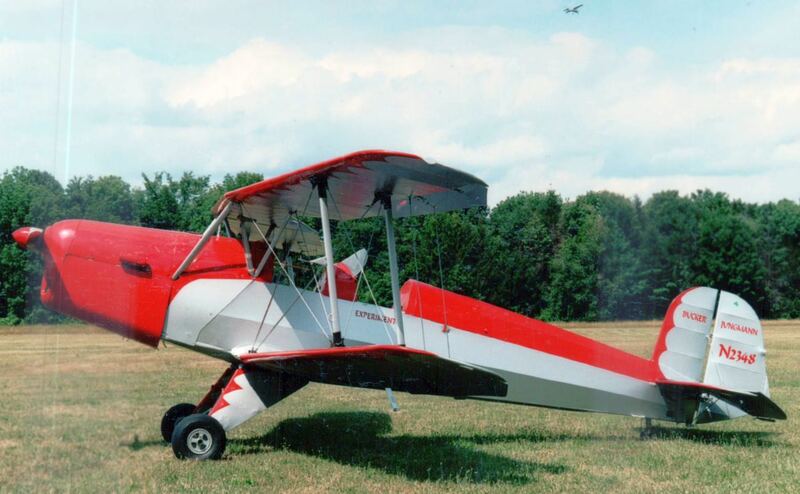 A 1960s photo by Michael Rovello of his restored Bucher Jungman biplane at Twin Pine Airport. 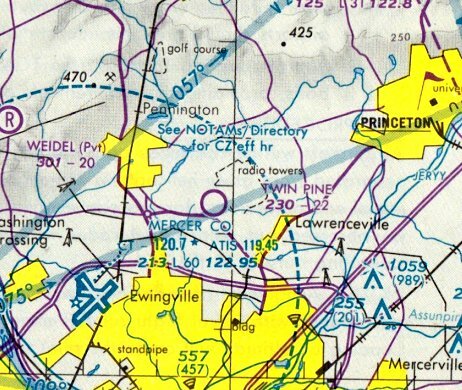 The 1965 NY Sectional Chart depicted Twin Pine Airport with a 2,200' unpaved runway. A 1969 aerial photo continued to depict growth of Twin Pine Airport's usage, with over 2-dozen aircraft visible on the field. 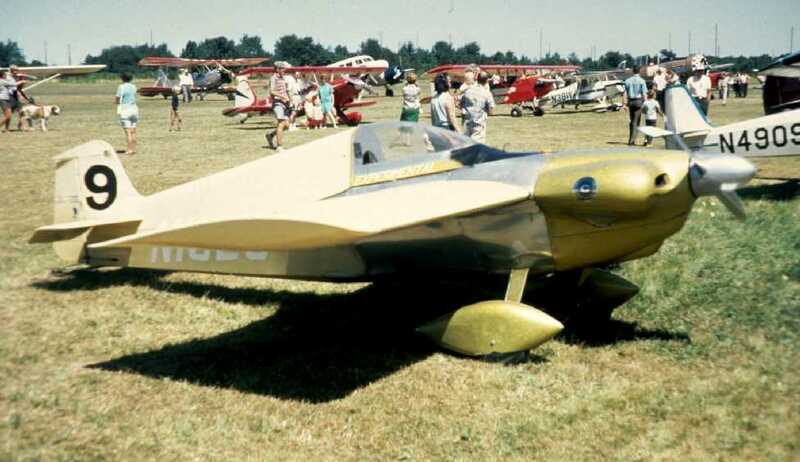 A 1969-70 photo by Keith Caulton of a Cassutt racer named Idjet's Midget at EAA Chapter 176’s 1968 Twin Pine Airport Fly-in. Gary Fitton reported, “My wife & I, and our 2 small children are standing in front of the biplane in the background! 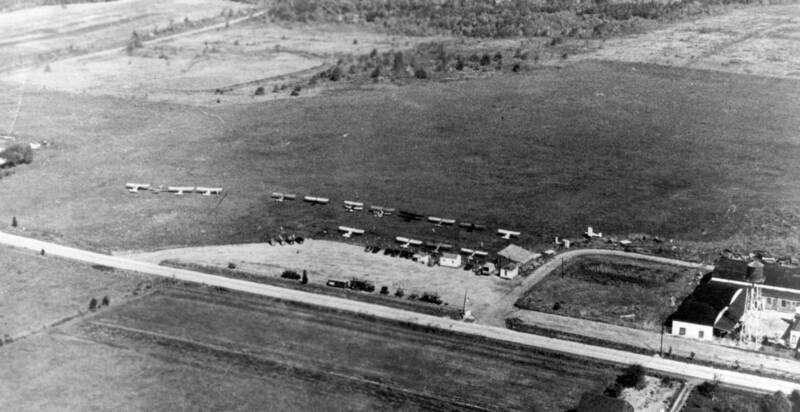 A 1970 aerial photo of Twin Pine Airport depicted 29 aircraft on the field. labeled simply as “Landing Strip”. in 1972, after a 15-year legal battle, Hopewell Township's restriction to the airport having only 3 aircraft on the field was overturned. A 1972 aerial photo depicted Twin Pine Airport perhaps at its peak of popularity, with a total of 37 aircraft visible on the field. depicted Twin Pine as having a 2,300' unpaved runway. A 1976 photo by Keith Caulton of hailstorm damage to a Cub. The hailstorm reportedly damaged almost all of the aircraft based at Twin Pine. The damage to the HedgeHoppers Cub required a complete recovering job. Someone tried to count the holes in one wing of the Cub, but lost count at some point over 200. Keith Caulton recalled, “I was the president of the Hedgehoppers flying club. 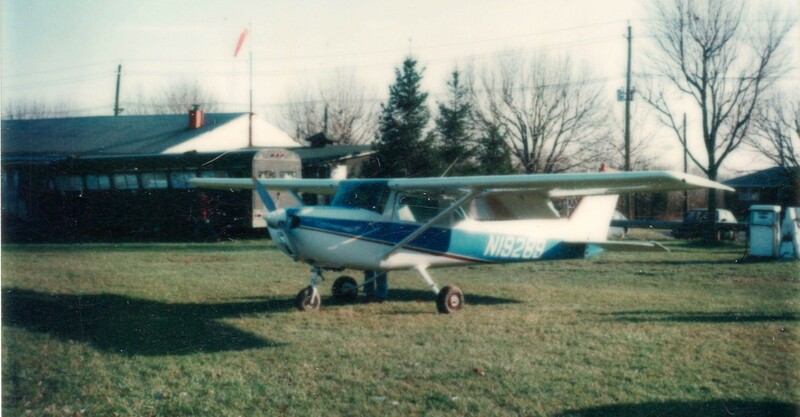 A 6/4/78 photo of a 1973 Cessna 150L at Twin Pine Airport. 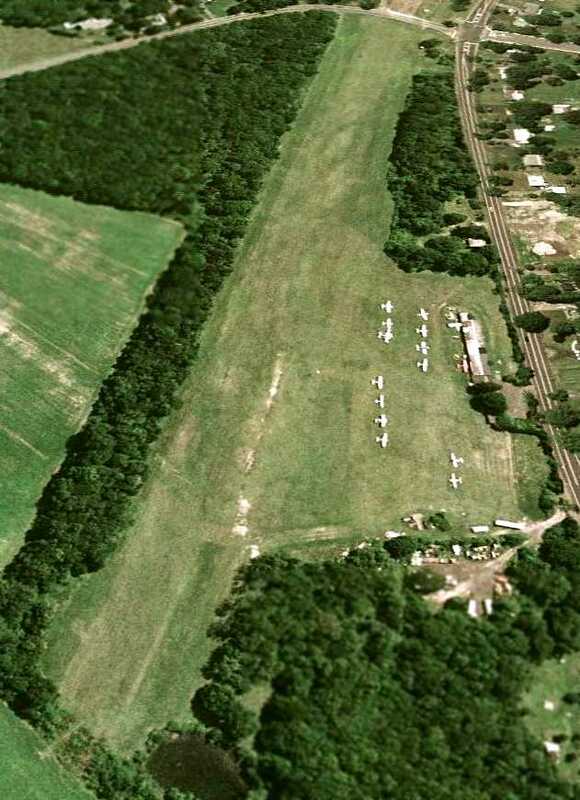 A 1979 aerial photo of Twin Pine Airport depicted 30 aircraft on the field. Walt Stepek recalled, circa 1980, “I opted to train at Twin Pine. There are an awful lot of stories that could be told about that place. One thing I remember about the hangar facing Pennington Lawrenceville Road was an open bay containing a disassembled Johnson Rocket stuffed in sideways. I wonder what ever became of that? 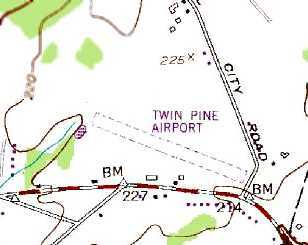 The 1981 USGS topo map depicted Twin Pine Airport as having a single unpaved northwest/southeast runway, with 2 small buildings along the south side. 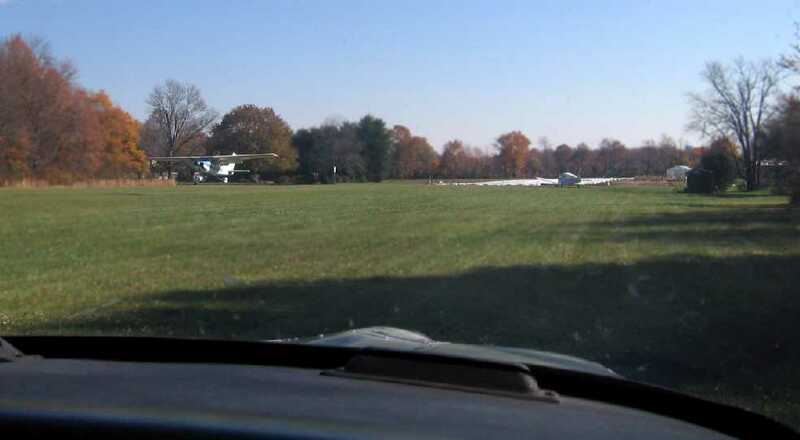 depicted the field as having several dozen light single-engine planes parked on the south side of the grass runway. in 1982, Twin Pine Airport submitted an application to build hangars for aircraft. This was rejected because the zoning board zoned the airport as residential. Therefore, hangars constituted a nonconforming use. 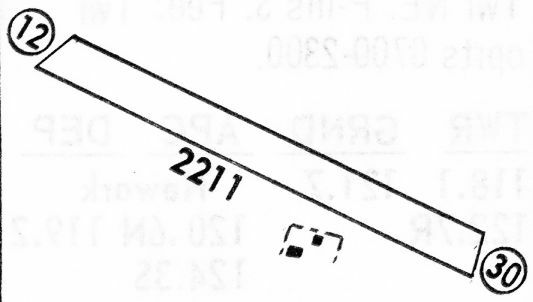 The 1987 NY Terminal Aeronautical Chart depicted Twin Pine as having a 2,200' unpaved runway. 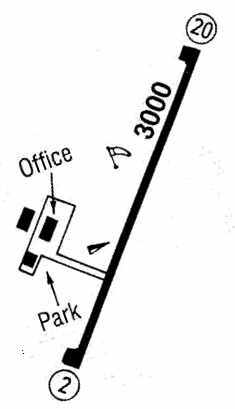 A 1992 street map (courtesy of Steven Boggess) depicted Twin Pine Airport as having a northwest/southeast runway. A 3/14/95 USGS aerial view looking east at Twin Pine Airport depicted a total of 13 light aircraft parked on the south side. A sad sight – a 4/4/04 photo by Nolan Huizenga of a Ryan Navion A (N514K cn NAV-4-2040) minus its empennage at Twin Pine Airport. nicknamed the "Red Baron", which regularly gave rides from the grass strip. but after the county ordered revaluations it was assessed at nearly $2,000,000. This caused a property tax increase from $17,000 to more than $36,000 per year, which in turn caused the owner to sell the airport. A 2006 article reported, “Jean Weasner & William Weisner, who owns the airport, told the committee that a developer has offered $2.5 million for the tract. But the Weasners want the airstrip to remain open fields & possibly continue to be used for aviation." Even the mayor grew up as a pilot there: Mayor Vanessa Sandom said the township would try to preserve the airstrip but did not know whether it would be possible. "I'm conflicted," she told Weasner. "Actually, I can fly. I got my pilot's license when I was 16. My dad used to take me to the airfield before I could drive. It was my way of reaching the stars." applied for $2 million in grants from Mercer County to turn the airport into athletic fields. Some people associated with the airport considered the actions of the local governments "stealing" by use of taxes. Costs of keeping the airport (including tax increases that peaked at a 220% increase in one year for the airport) left the Weisner's no choice except to sell the land. Heaven forbid that a private property owner would be allowed to maintain green space which also serves the local aviation community. 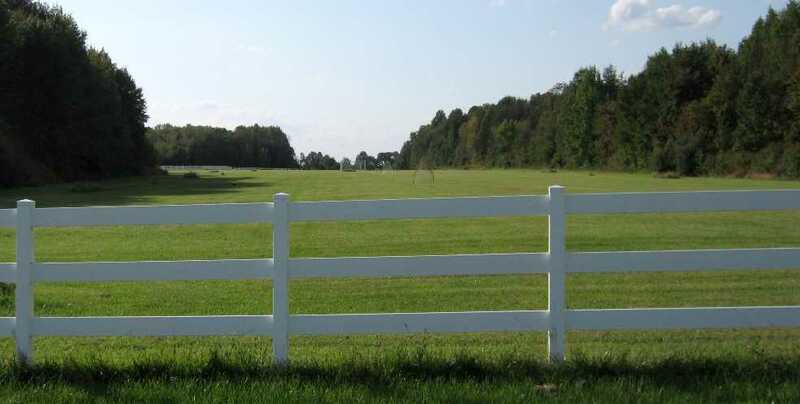 But in this case, the local government had their eye on the property, intent on converting it into soccer fields. How many other small privately-owned airports will we lose to this kind of maneuver? A circa 2006-2010 aerial view looking west at 9 light aircraft at Twin Pine Airport. A January 2006 photo of a few planes next to the Twin Pine hangar. 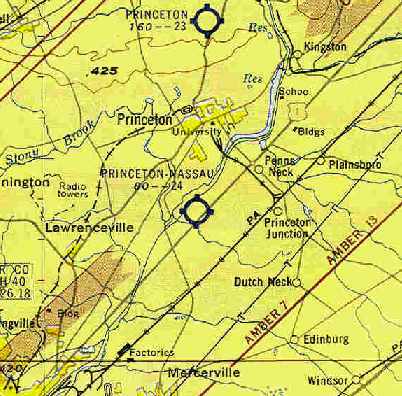 The last aeronautical chart depiction which has been located of Twin Pine Airport was on the May 2006 NY Terminal Aeronautical Chart (courtesy of Stu Sibitzky). It depicted Twin Pine as having a 2,200' unpaved runway. A 11/3/06 photo by Tony Richardson of the Twin Pine runway. Tony recalled, the photo “is from an EAA Chapter 176 meet. I got my first flight out of this airport in a Piper Tomahawk. 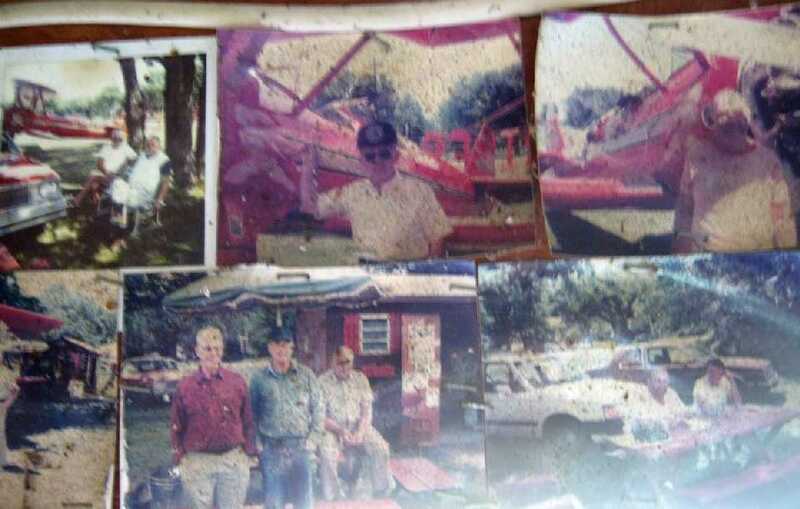 A June 2007 photo by Joy Yagid of planes at Twin Pine Airport, many of which had obviously not moved in a while. A June 2007 photo by Joy Yagid of the Twin Pine Airport office building. A June 2007 photo by Joy Yagid of a rare Varga 2150A Kachina (N8274J cn VAC-120-79) rotting away in the grass at Twin Pine Airport. A 7/5/07 aerial view looking east at Twin Pine Airport showed a total of 14 aircraft on the south side. and listed the owner as William Weasner. It listed a total of 15 aircraft based on the field, which was said to conduct an average of 32 takeoffs or landings per day. Tony Richardson reported on 4/3/08, “There was a Navion based at Twin Pine that my dad & I were trying to save from being scrapped. When I realized it was missing, some people working in the hangar told me that it was stolen. Wings were cut off & the plane was sold to scrappers. A 4/6/08 photo by Gary Fitton of N8278S, a 1965 Cessna 150, seen at Twin Pine Airport on its closing day. 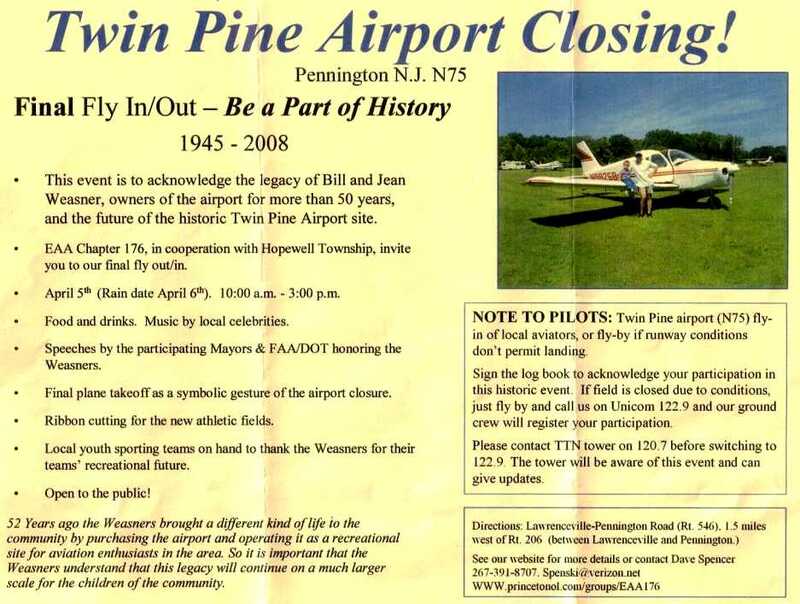 The program for Twin Pine Airport's 4/6/08 Final Fly In / Out (courtesy of Gary Fitton), held by the airport's EAA Chapter 176. Tony Richardson recalled, “I was fortunate to ask a few questions from Mr. Weasner on the closing ceremony. I asked him why people keepmistakingthe airport's name and calling it 'Twin Pines' as it sometimes has said in the local papers. Mr. Weasner told her that he used to run the Twin Pine hobby shop in the town of Pennington. There were 2 pine trees right outside of the shop. The shop is still there, he said, minus one tree. Another topic I asked him about was thepeculiarsight of the Cessna sitting near a house a fewhundredfeet from Runway 30, off the airport property. and Mr. Weasner said he did remember the plane but didn't know what happened to it. A 2009 photo by Tony Richardson “looking directly down Runway 30, showing the fences & soccer nets. A 2009 photo by Tony Richardson “inside the small hut near Runway 30's end. Apparently, this is the hut people would go to for the 'Red Baron' rides. The 'Red Baron' is that red Boeing Stearman in the picture. A January 2010 photo of a Cessna 310, Varga Kachina, Cessna, and Mooney which remain stranded in the high grass of the former Twin Pine Airport. These aircraft deserve a better home. A January 2010 photo of the office of Eagle Aire Flight Training at the site of Twin Pine Airport. A January 2010 photo looking northeast at the back of the former Twin Pine Airport hangar. yet 4 light aircraft remained stranded within a fence around the former hangar. 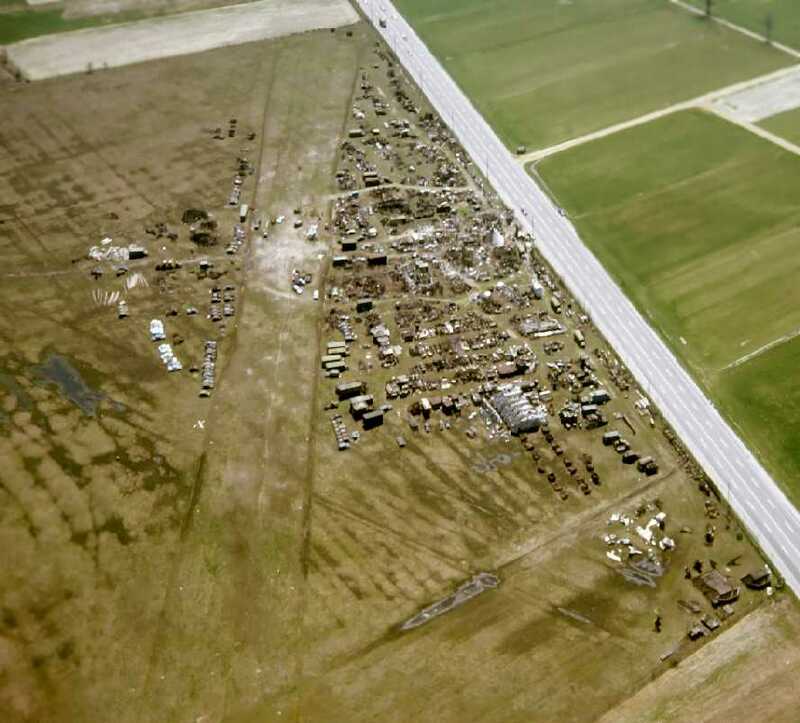 A 2010-2016 aerial view looking north at the remains of Twin Pine Airport: the hangars surrounded by a fence, with the rest of the airport property having been covered with athletic fields. A 2012 aerial view Tony Richardson looking northeast at the remains of Twin Pine Airport from a Cessna 172. 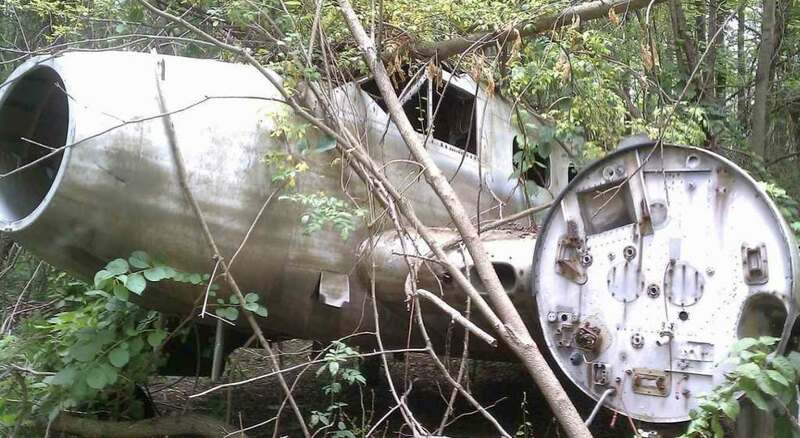 A 2012 photo by Tony Richardson, who observed, “One of the coolest things I found at the airport was this Beech C-45G c/n 51-11481, N7615C, sadly being left to rot in the woods west of the runway. According to it's registration, it was registered to Engle Flying Service, which was based at the also-abandoned 3M Airport. The plane has been sitting in the same spot since the 1970s. The thought of getting some R-985s on that plane definitely crossed my mind. An 4/7/12 photo of the Beech C-45G, sadly being left to rot in the woods west of the runway, complete with a tree growing up through its rear fuselage. 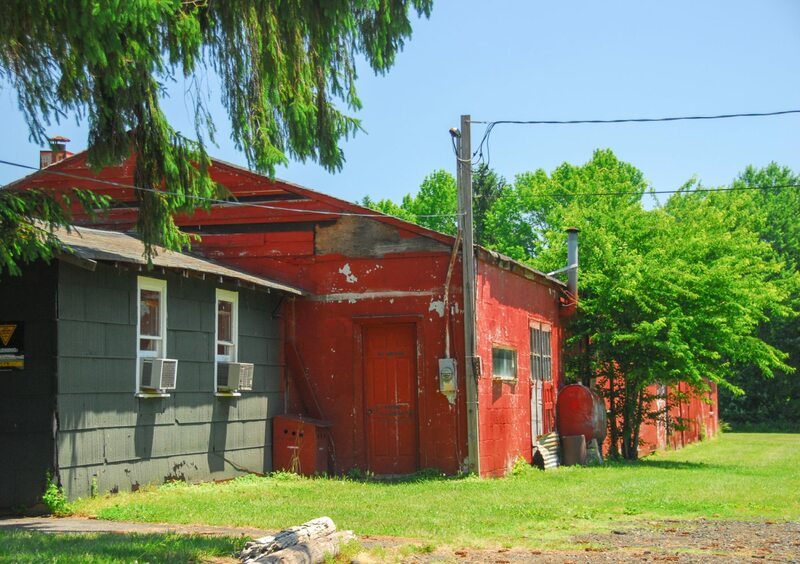 An article in the 8/27/15 nj.com (courtesy of Tony Richardson) described the Twin Pine hangars being removed. Tony Richardson reported on 1/1/16, “The office (small, white hut in previous photos) had been demolished a year or so ago. 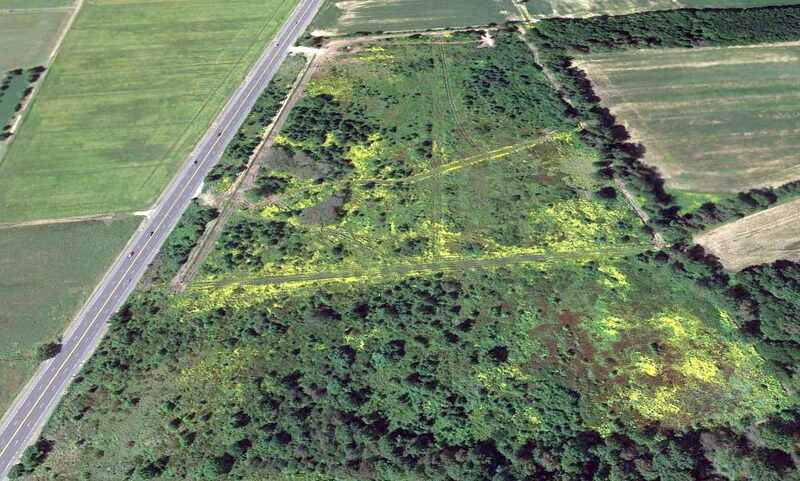 A sad sight: a 2017 aerial view shows the last remains of Twin Pine Airport have been removed: the hangars are gone. 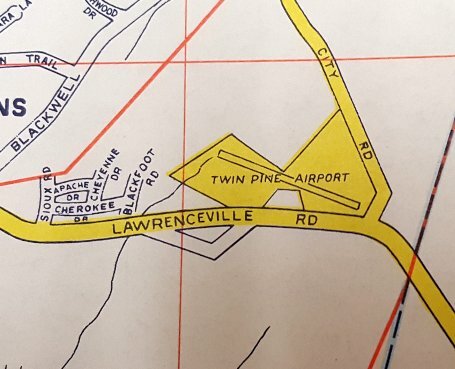 The site of Twin Pine Airport is located northwest of the intersection of Pennington Lawrenceville Road & Federal City Road. 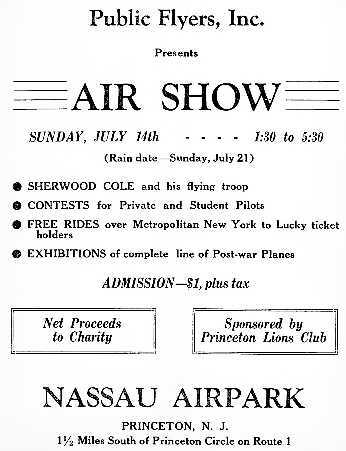 An advertisement for a 7/14/46 air show at Nassau Airpark (courtesy of Mark Hess). This short-lived little general aviation airport was located on the south side of the town of Princeton. According to Dennis Waters, “In the aviation boom following World War II, an airport was constructed along US-1 in West Windsor, known as the Nassau Airport. The earliest reference to Nassau Airpark which has been located was an advertisement for a 7/14/46 air show at Nassau Airpark (courtesy of Mark Hess). 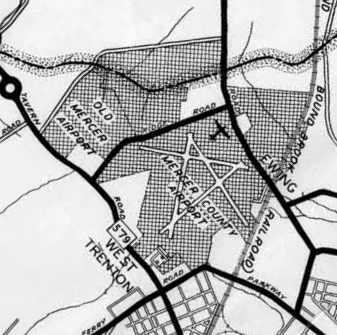 The earliest depiction which has been located of the Princeton Nassau Airpark was on the 1947 topo map. 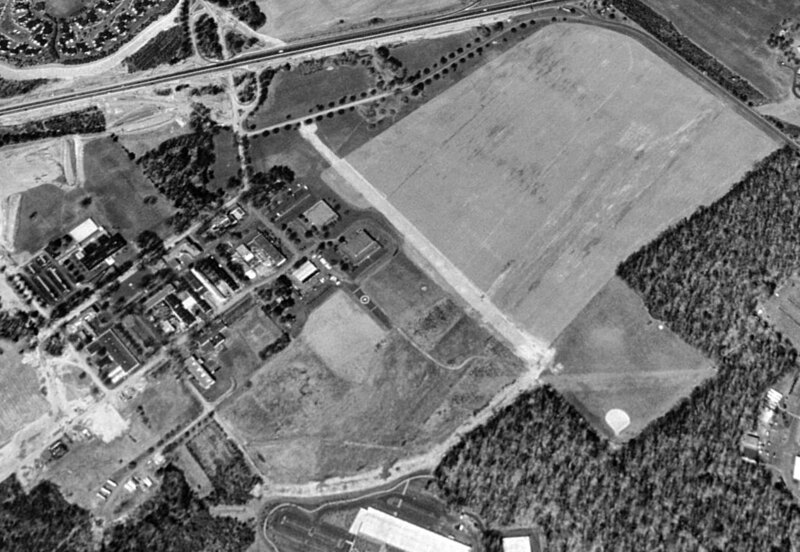 The earliest photo which has been located of Princeton Nassau Airpark was a 1947 aerial photo (admittedly very low-contrast). with a single light aircraft just to the east of the runway intersection. reported that “Nassau Airpark” offered half-hour flying lessons for $5 in 1949. 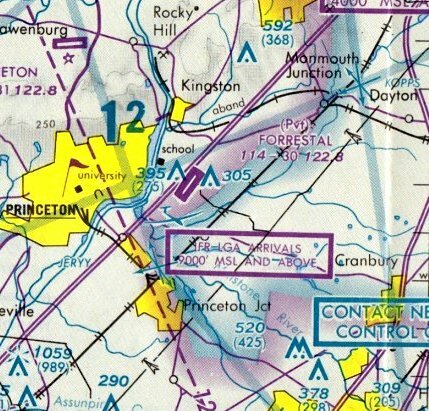 However, Princeton Nassau Airpark was not yet depicted at all on the 1950 NY Sectional Chart (courtesy of Mike Keefe). 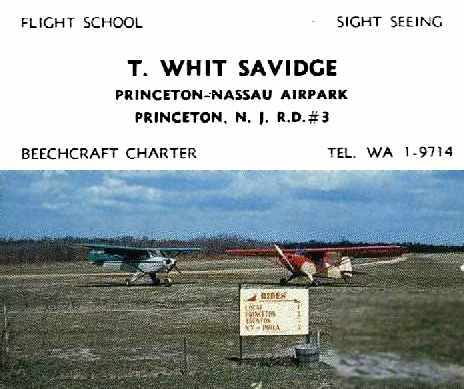 Dave Larky recalled, “Nassau Air Park was operated by Thomas Whitfield Savidge & his wife Dorothy. 'Whit' was an instructor & designated examiner & Dottie ran the office. They had 3 J-3 Cubs when I first met them in March of 1951; later they bought a Piper PA-23 Tri-Pacer. Whit did the light maintenance - oil changes, etc. in a J-3 with torn fabric in the horizontal stabilizer – holes maybe 3-4 inches across. There were 2 runways, grass, the longer as 2,100' seems about right. Dave continued, “Whit & Dottie were the whole outfit – no other instructors, no mechanics, etc. I think they had their own gas pump because I don’t remember flying to another field to gas up. Whit was an excellent instructor & it was easy to learn with him. There were about 5 of us, all working at RCA David Sarnoff Laboratories in Princeton, who started lessons at the same time. My first lesson was on 3/5/51. Typical lessons were 30 minutes. Dave continued, “By 1953 several of us owned airplanes. I bought my first airplane, a Piper PA-20 taildragger N1725A, on 12/2/53. The 3-place Super Cruiser shown in the photo belonged to one of my group. with a total of 8 light aircraft visible on the field. 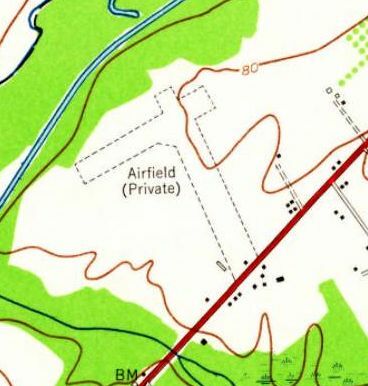 labeled simply as “Airfield (Private)”. was on the January 1955 NY Sectional Chart (courtesy of Chris Kennedy). The Aerodromes table described the field as having 2 runways, with the longest being a 2,400' turf strip. depicted Princeton Nassau Airpark as having a 2,400' unpaved runway. A 1957 aerial photo depicted Princeton Nassau Airpark as having 2 unpaved runways. 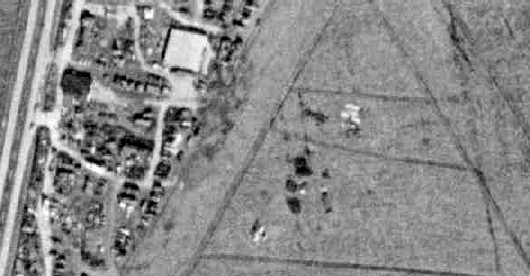 A closeup from the 1957 aerial photo, showing 2 planes at the southern end of the Princeton Nassau Airpark. having 2 unpaved runways: 2,100' north-northwest/south-southeast & 1,900' northeast/southwest. and the manager was listed as Thomas Savidge. with a picture of a Piper Super Cruiser & PA-12 on the back side of the card. was on the 1959 NY Sectional Chart (courtesy of Bill Ward, via Tom Kramer). It depicted the field as having a 2,400' unpaved runway. the airport closed in late 1959. Princeton Nassau Airpark was no longer depicted. while the western portions of the 2 former runways were still evident. erasing any trace of the former Princeton Nassau Airpark. superimposed over a circa 2005 street map by Tom Kramer. looking northwest at the site of the former Princeton Nassau Airpark. with no recognizable trace remaining of the former airport. 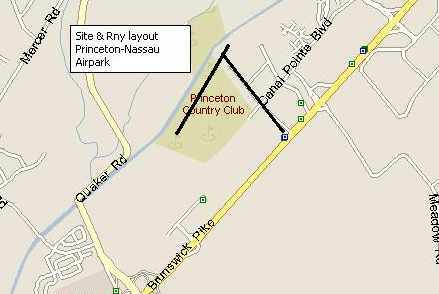 The site of Princeton Nassau Airpark is located west of the intersection with of Route 1 & Emmons Drive. 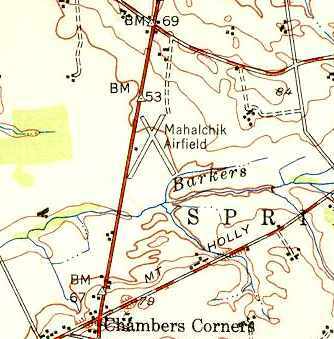 Mahalchik Airfield, as depicted on the 1949 USGS topo map. nor listed among active airfields in the 1945 AAF Airfield Directory (courtesy of Scott Murdock). who went on to become a county resident of some note. and earned the nickname 'Lucky' by being the sole survivor of an aircraft crash, I think it was in South America. who ran for Congress & backed up his convictions with a shotgun. as it was not yet depicted at all on the 1945 NY Sectional Chart. was on the 1949 USGS topo map. It depicted the field as having two 1,900' runways, intersecting in an “X” shape. A single small building was depicted on the west side of the field. Scott Roberts recalled, “He populated the airport with small military surplus trainers. and most of his aircraft & his hangars were destroyed. he collected anything & everything. The 1950 NY Sectional Chart (courtesy of Mike Keefe). depicted Mahalchik as having a 2,000' unpaved runway. 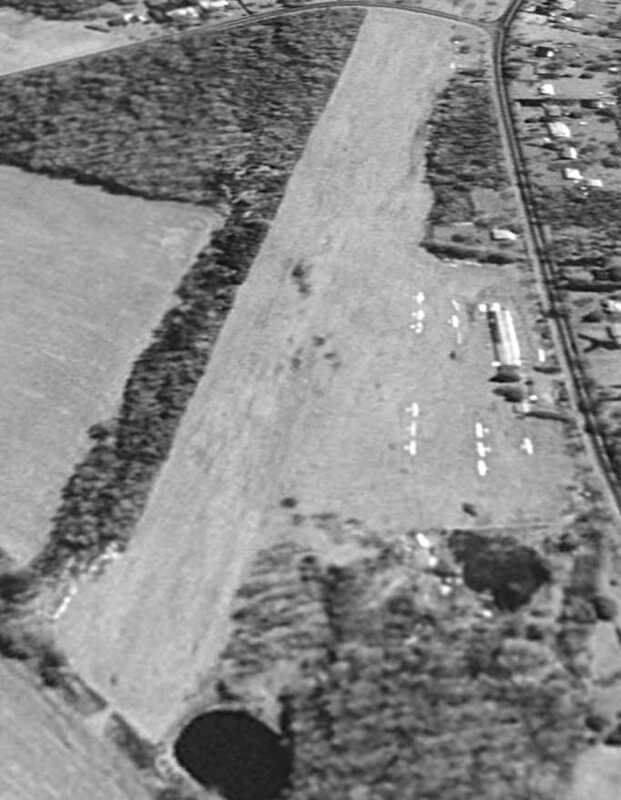 The earliest photo that has been located of the Mahalchick Airfield was a 1953 aerial view. with John Mahalchick's scrapyard on the west side of the field. with the northwest/southeast runway having been added at some point between 1953-56. A closeup from the 1956 aerial photo appeared to depict one aircraft, at the bottom-center. because they wanted his land to build a race track. and his house was burned down, he got out, and had nowhere to go. His wife had left at that point, I think. (he had all sorts of 'disagreements' with local officials). both from his own stockpile, and the local dump. At 5 pm that Friday evening he started constructing the 'tin teepee' out old 2x4s & scrap metal. He finished just before 8 am on the following Monday morning. demanding he remove it, because it didn't meet building codes. it seems this type structure was completely outside of the written codes, so a legal loophole! was not subject to it, being preexisting! John Mahalchik lived there the rest of his life. I actually was invited in once or twice – as you might expect, it was a true hermit's dwelling. whatever rubbish at hand used as fuel, no running water, and only minimal electricity. a framed pencil drawing of a pair of USAF wings about 6 inches across. 'This #### for sale?' with a big grin. was on the January 1958 NY Sectional Chart (courtesy of Chris Kennedy). It depicted the field as having a 2,000' unpaved runway. Scott reported, “My friend, Steve Roberts landed there. He said he landed there in about 1958-59, flying a PA-11 Cub on one of his student pilot cross country flights. John Mahalchik signed his logbook as having landed. grass cut well, and clearly identifiable from the air 20 miles away. he seems to recall them being cut in half & painted 55 gallon drums. with the beginnings of the junk collection in well defined areas, well off the runways. But no other aircraft seemed to be present. But it was so beautiful he was compelled to land. Luther recalled, “My step-grandfather was Andrew Mahalchik, John Mahalchik's father. I remember we stayed at the junkyard sometime around 1960 for an overnight visit. It was a neat place to be as a kid. His house was under construction I guess, I remember the floor was not complete. His family was still together at that time. Uncle John was an Air Force pilot during the Korean war. He was an interesting man & at the same time hard to understand. as it was no longer depicted at all on the January 1963 NY Sectional Chart (according to Chris Kennedy). 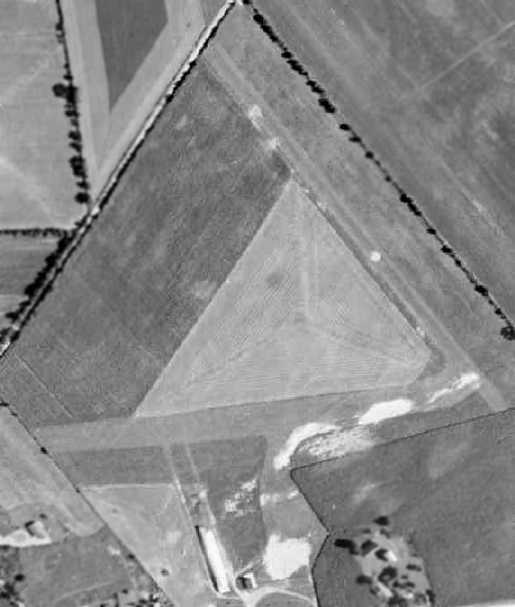 they were no longer the sharply-outlined strips as seen in the 1956 aerial photo. 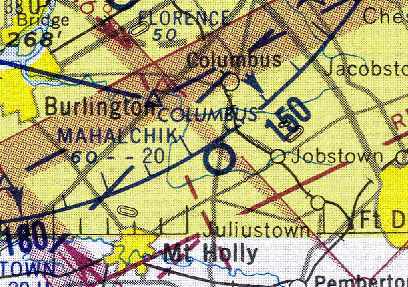 The Mahalchik Airfield was no longer depicted at all on on the 1969 topo map. had been removed at some point between 1963-70.
but there was no longer any recognizable outline of the former crosswind runway. An undated photo of what appears to be 7 Navy K-class blimp gondolas at Mahalchik Airfield. showing the 2 grass runways & remains of numerous aircraft, trucks, etc. Note the infamous “Tin Teepee” midway along the road. Scott Roberts recalled, “You can see why I loved to hang out there when I was younger! John Mahalchik was a very guarded person by the time I met him. He would typically be somewhere on the property, and you'd have to honk to get his attention. and if he thought he had it, he would guide you in, sell it to you, and then guide you out. If he didn't have what you needed, or if he just plain didn't like you, he'd send you on your way. I had the privilege of being able to stop by, and once he knew I was there, have free run of the place. A 1970s aerial view by Rich Kolasa (courtesy of Scott Roberts) of components of some unidentified jet aircraft. A 1970s aerial view by Rich Kolasa (courtesy of Scott Roberts) of the control cars from 7 WW2-era K-type Navy airships. However, according to Scott Roberts, “John used to fly his Cessna 150 out of there, long after he stopped being listed as an airport. For several decades until his passing in the late 1980s this personal scrap drive continued. but a lot of neat things went all over the world - including a CG4A Waco glider. the remaining markers of the runway. A 1995 USGS aerial view looking north showed the outlines of both former Mahalchik runways were still recognizable. for years there was all sorts of machinery, vehicles, etc. piled along them. An 8/26/08 aerial photo still showed the recognizable outline of the runway. 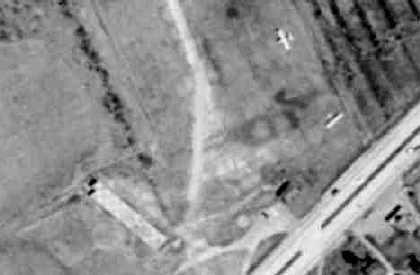 A 2013 aerial view looking north showed several new paths had been carved onto the property, erasing the last traces of Mahalchik Airfield. Ray Verner reported in 2013, “The land is vacant. north of its intersection with Monmouth Road. 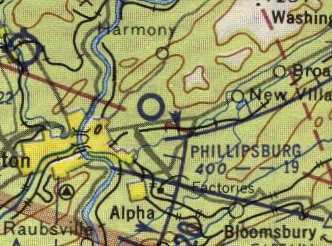 Phillipsburg Airport, as depicted on the January 1950 NY Sectional Chart (courtesy of Mike Keefe). (according to his obituary in the Easton Express newspaper, courtesy of Ron Titus). was on the 1930 "Rand McNally Standard Map of New Jersey With Air Trails" (courtesy of Chris Kennedy). 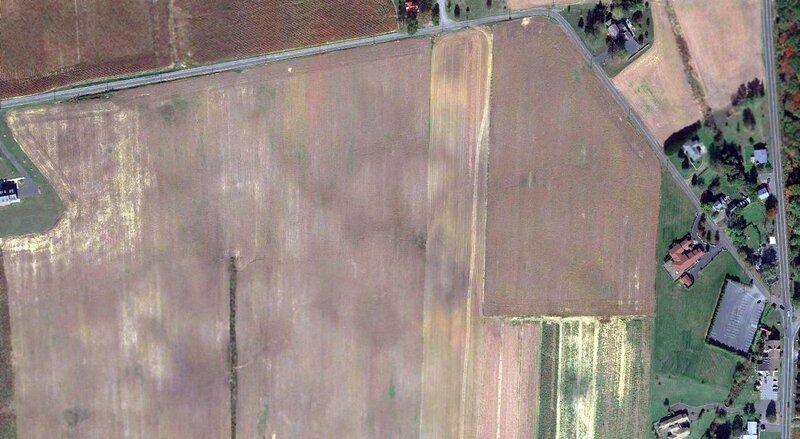 and the field was described as being "L"-shaped, measuring 1,500' northeast/southwest x 1,250' north/south. A 1931 aerial view did not show anything specifically-recognizable as an airfield, just an open grass field. 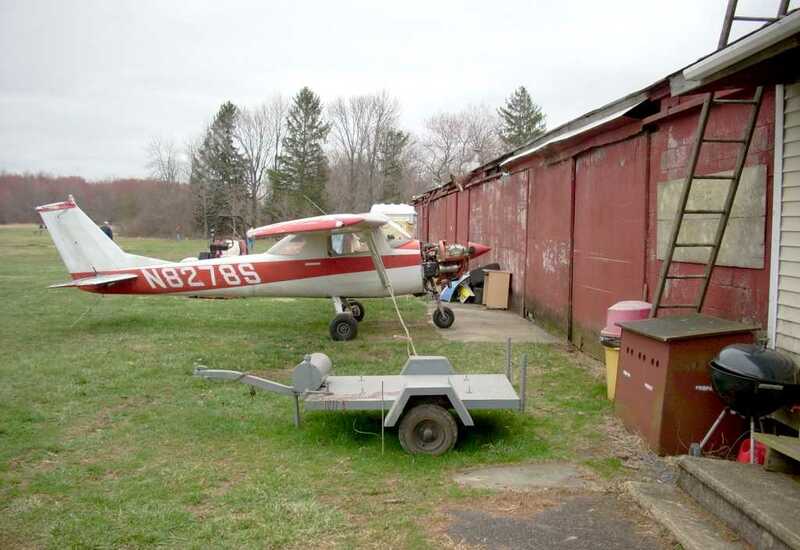 According to Ron Titus, “In 1946, Ted Phillips bought the Phillipsburg Airport from the Walter Lifer family after it had been closed during WWII. 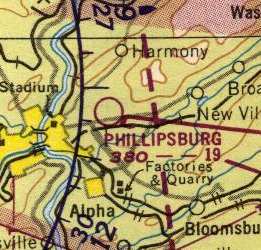 Phillipsburg Airport was not depicted at all on the 1947 USGS topo map. 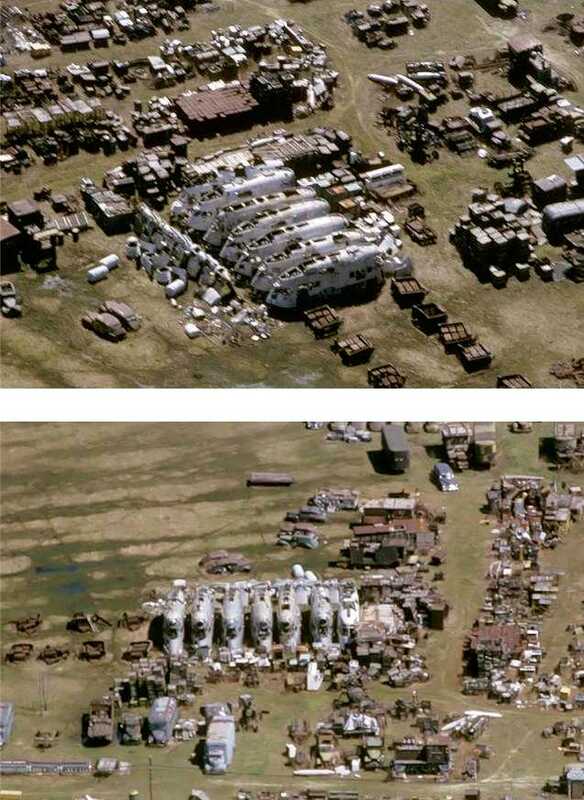 causing extensive damage to the hangars, buildings, and aircraft. as having a 1,900' unpaved runway. including Terry Phillips, the daughter of the airport owner. Ron Titus recalled, “In 1955 there was a bad flood of the Delaware River between Phillipsburg & our sister city in Easton PA.
All the bridges were knocked out. 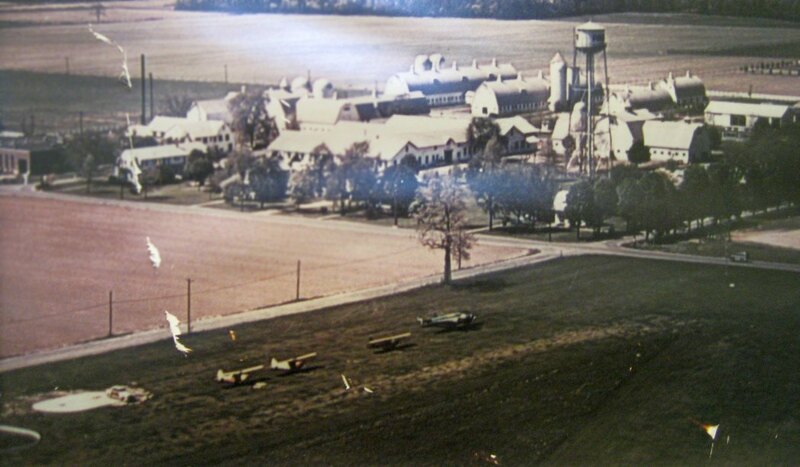 The only photo that has been located showing the Phillipsburg Airport while it was open was a 1956 aerial view. with 2 buildings (hangars?) on the south side of the field. There were not any aircraft visible on the field. 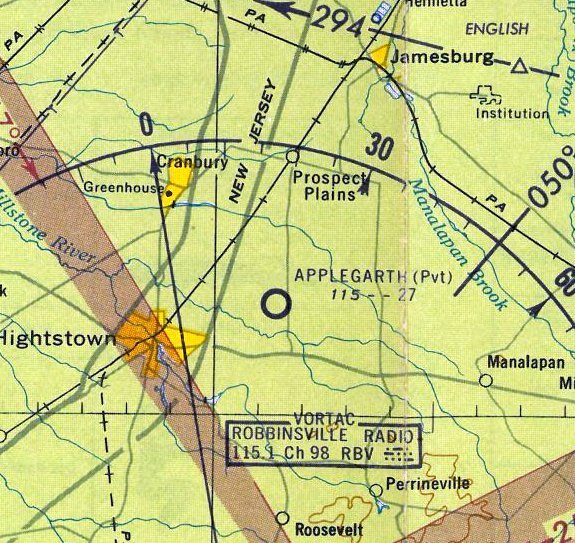 Phillipsburg Airport, as depicted on the July 1957 NY Sectional Chart (courtesy of Mike Keefe). described Phillipsburg as having 2 runways, with the longest being a 1,900' dirt & turf strip. Ron Titus recalled, “I remember it as a 12 year old Civil Air Patrol cadet back in 1958. We stored our old L-4 there then. Our Commanding Officer of the Phillipsburg unit back then was Captain Ed Martino. There wasn't much there at that time. 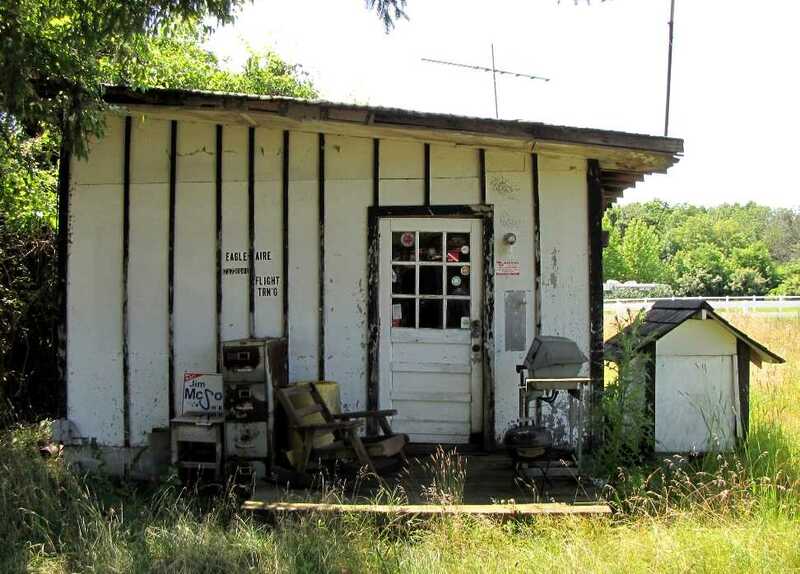 There was the Airport Bar & Hotel & a small cement block building out on Route 57. According to Ron Titus, “The Phillipsburg Airport would continue to operate a few more years after the death of Ted Phillips. would force her to close it in the late 1950s after a 10-year battle to keep the property. as it was not depicted at all on the 1960 NY Sectional Chart (courtesy of Mike Keefe). reasons were given for the closing of 13 New Jersey general aviation airports. which wanted to build a school on the airport land. The courts ruled the township had the right to condemn the land & build a school. Ron Titus recalled, “The Township that closed it up with condemnation was Lopatcong Township. They wanted it for an elementary school. and the airport land would be right in the middle off to the side. No one knew that though, back then, when it was being grabbed up. which would be built on the southern portion of the former airport property. and it also depicted the school which had been built over the site. 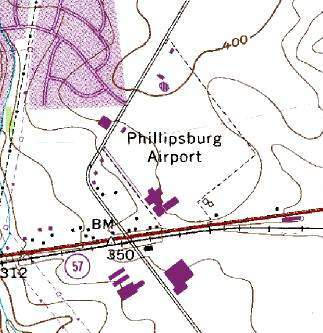 Phillipsburg Airport was still depicted on the 1994 USGS topo map. 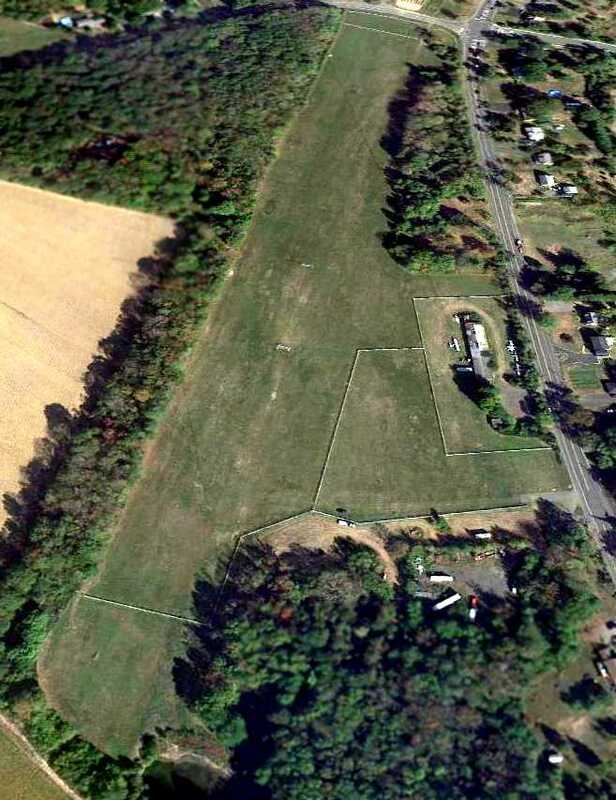 A 2012 aerial view looking north showed the property outline was the last recognizable trace of Phillipsburg Airport. 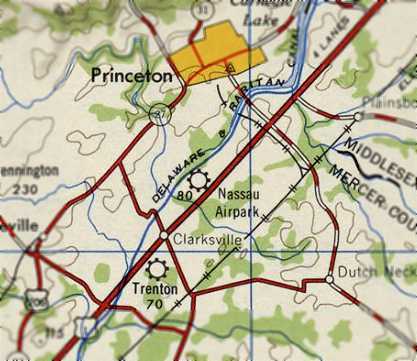 The site of Phillipsburg Airport is located northeast of the intersection of Routes 22 & 57. Thanks to James G. for pointing out this airfield. A 1956 aerial view depicted Forrestal Airport as having a single unpaved northeast/southwest runway. This small airport was operated by Princeton University for aeronautical research. 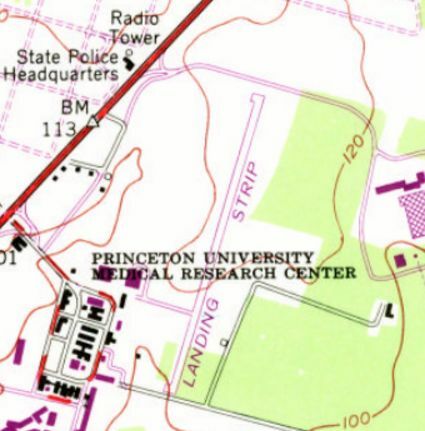 It was located along the east side of Route 1, two miles east of Princeton University. convinced the University to acquire the property on the east side of Route 1 in 1950.
just as the facility at the Forrestal Research Center was being put together. he had to help convert greenhouses into hangars & build the quarter-mile long airstrip. A 1953 aerial view did not depict any recognizable signs of a runway. with a single light plane parked outside a hangar on the southwest side. A 1957 aerial view depicted Forrestal in basically the same manner. and resumed working at the research center as both an instructor & flight researcher. By then, "things were really humming," he said. but perhaps most impressive were the ground effect machines, or hovercraft. Nixon worked under Tom Sweeney & Ed Seckel, both instructors in the aeronautical department. Sweeney was his immediate boss at the flight laboratory & was the creative mind behind the ground-effect machines. The size & range of uses for these machines varied widely. and even an air version of the wheelbarrow. to be pushed & carry small cargo on construction sites. They also built the AG-GEM, a medium-sized, 43 hp hovercraft that was flown in the mid-1960s to test the concept of spraying crops. It was taken to Toms River & used successfully on a cranberry bog, Nixon said. until it was left outside & destroyed by the weather, he said. But the largest ground-effect machine built was the P-GEM, a 20' diameter circular hovercraft with a 180 hp lift engine & 43 hp tail engine. and even got the distinguished opportunity of being escorted down Route 1 by police. "Route 1 was quite a challenge. Cars were pulled over to the side & there was only a couple feet of clearance, but it never hit anything," Nixon said. The P-GEM was last flown in the 1980s & has since been bulldozed & discarded by the University, he said. A 5/2/60 USGS aerial view showed that Forrestal had gained a paved northeast/southwest runway at some point between 1957-60. Forrestal was not yet depicted on the 1961 Philadelphia Local Aeronautical Chart (courtesy of Mike Keefe). The earliest directory listing which has been located of Forrestal Airport was in the 1962 AOPA Airport Directory. and the operator was listed as "Engineering Department, Forrestal Research Center". It included the note, "Caution: Closed to the public." 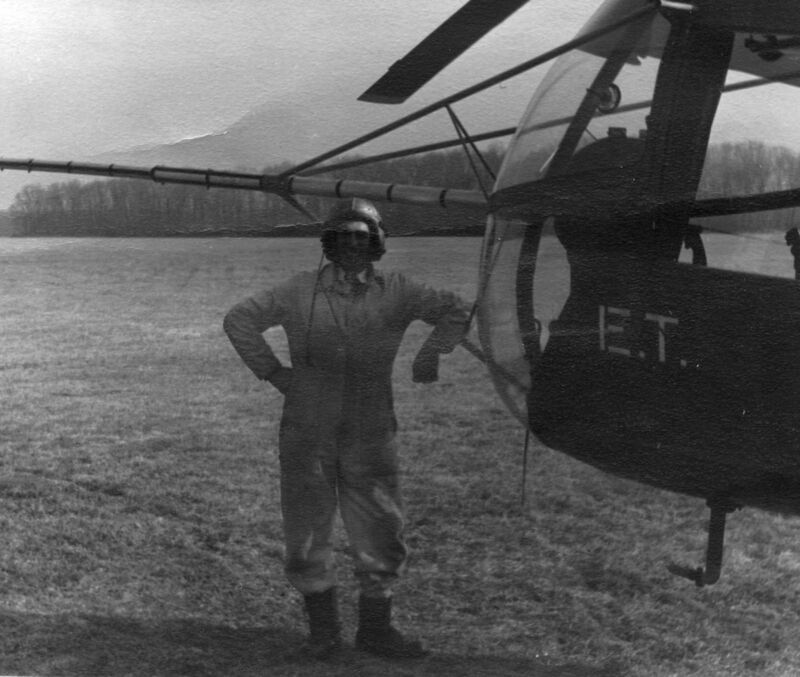 A circa 1960s photo of Willson McCredie with a Piasecki HUP Retriever helicopter (with what appeared to be an experimental pitot boom) at Forrestal Airport (courtesy of his daughter Gail Faherty). which is odd, even for a private airfield. seen in front of the old Forrestal hangar (courtesy of Albert Newton, via Steve Sweeney). The craftsman most responsible for the construction of the AgGem was Albert Newton. The AgGem evidently reused the cockpit bubble from a Hughes 300 helicopter. and who was privileged as a child to spend most of his Saturdays with him there. In Steve's words, "Forrestal was a really neat place. including 2 active flight test laboratories, Flight Dynamics & Advanced Flight Concepts." 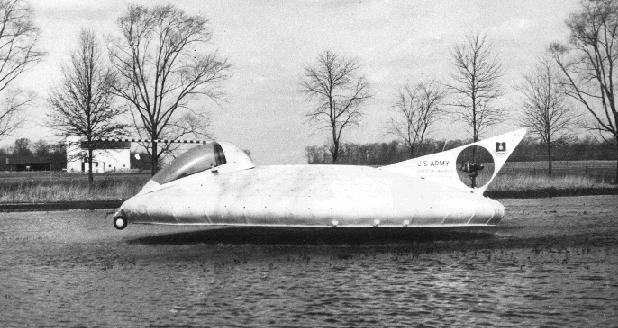 An undated view of the Princeton P-GEM hovercraft. flying over over a pond at Walker-Gordon farms, adjacent to Forrestal (courtesy of Albert Newton, via Steve Sweeney). They simply flew it over there for over water trials. Unfortunately, both the AgGEM & the PGEM were lost to the scrapper. An undated photo of the Princeton 20' P-GEM hovercraft at Forrestal, with a Piper Tri-Pacer visible behind the Jeep. An undated photo of N601K, a very unusual experimental aircraft on the Forrestal runway. 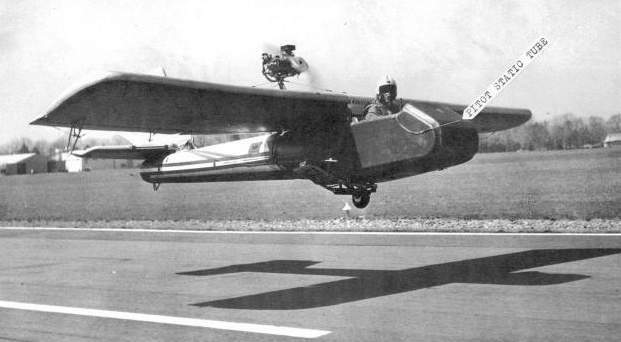 A circa early 1960s photo of the smaller single seat "Airscooter" hovercraft (courtesy of Albert Newton, via Steve Sweeney). however an older sister machine survives today at the American Helicopter Museum in Brandywine, PA.
Additionally, a 3rd similar airframe belongs to the Smithsonian. from about 1958-70, I believe. This research, both theoretical & applied, resulted in four man carrying machines, built at Princeton. in order to travel to a local farm for trials over potatoes. This was to see how crops would react to the intimate nature of an air cushion vehicle." on the taxiway at Forrestal (courtesy of Albert Newton, via Steve Sweeney). 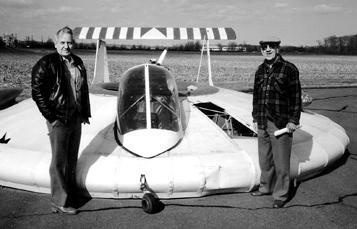 Keith Caulton recalled, “My dad took me to the Forrestal Airport mostly to look at the hovercraft. that apparently took place after the photograph [above]. Steve Sweeney recalled, "The aeronautical engineering department owned several aircraft over the years. In addition, there were other aircraft that were loaned, or sent to Princeton for evaluation. At the end of the laboratories life there were 4 airplanes. the other was stock, used for pilot proficiency. Sweeney continues, "Lastly there was a Lockheed LASA. That LASA was one of 2 airframes designed & built by Lockheed for construction abroad. The LASA was donated to Princeton, after Lockheed was done with it." was a utility plane built for the Mexican market. Two were built by Lockheed in Georgia, and small numbers were eventually produced in Mexico & Italy. and other interesting machines that were either built at Princeton, or wound up there over the years." "Forrestal Airport, and the entire Forrestal Campus was very much alive & hitting it's stride during the 1960's. and directly impacted the work at the hangar. I would say that active flight testing was about over with by the late 1970's." "It was a rare day when there were no visitors on the flight line. Grumman S2's, an Albatross, a touch & go by a Navy blimp, and a Lake Amphibian." "The original hangar was replaced with a new building in 1968, I believe. The old hangar was then used as a garage for the motor pool. So, there was only one active hangar." 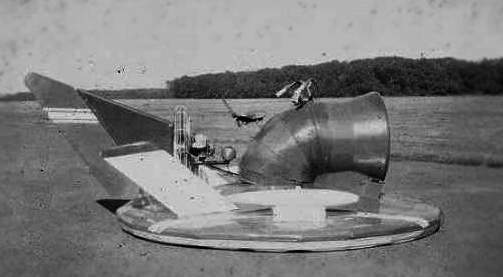 An undated photo of the Goodyear Inflatoplane, tested at Forrestal (courtesy of Albert Newton). of another unusual aircraft tested at Forrestal - the Goodyear Inflatoplane. The Army & Navy had several of them built in the 1950's. used to construct their blimps, rubber impregnated fabric, probably Dacron. It was inflated to about 5-7 PSI to make it semi-rigid. When it is deflated, it was folded up & stuffed into a 5 sq-ft. box. The only rigid parts were the engine & pedestal & landing gear assembly. They were intended to be parachuted down to a stranded pilot that had been shot down behind enemy lines. start the engine (hand crank), get into the cockpit & fly back home. Newton says, "The airplanes did fly, but it was not easy to get it started & airborne. The Army did some flight tests but they had some fatalities & abandoned the whole idea. and do some flight testing on it at Forrestal. and it would be worthwhile for student research." and I installed the test equipment & maintained the aircraft & cranked the engine. It was difficult to attach things because it was flexible. Some items had to be mounted on the landing gear structure. Other sensors had to be fastened with duct tape. At the speeds we were flying at, It held up pretty well. After several months, the testing was more or less completed. One of the test installations was a 16mm movie camera mounted on a outrigger. he said "Stop flying this airplane & get it out of here." We deflated it & put it back in the box & shipped it to Goodyear to put in their museum. I believe it still exists & is kept inflated." 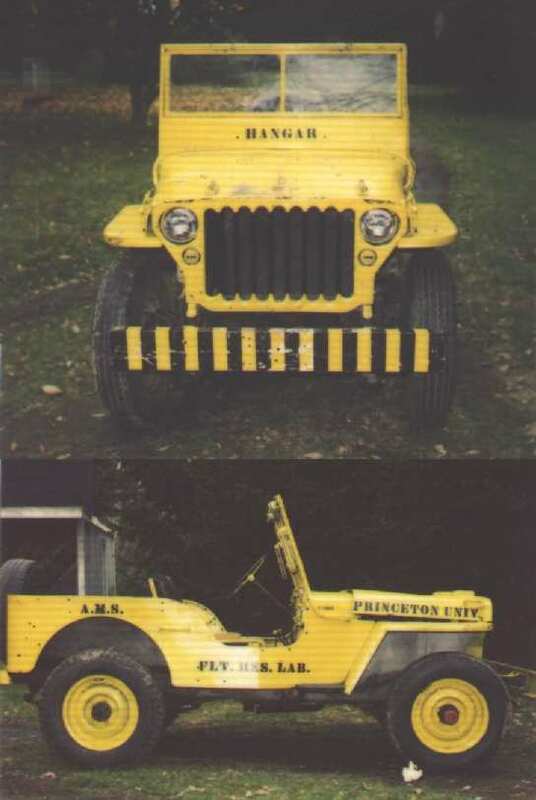 An undated photo (courtesy of Jeffrey Hoch) of a Jeep previously used as Forrestal Airport. testing many kinds of experimental flight vehicles. Among them were ground-effect machines, commonly known as hovercraft. Many of these machines looked like they could have come from outer space. while being tested at the University's flight research facility at the Forrestal Research Center. "and people would stop to see what was going on. I think some actually thought they saw a UFO descending on the airfield." was on the 1964 NY Local Aeronautical Chart (courtesy of John De Nicola). It depicted Forrestal as a private field with a 3,000' paved runway. A 1969 aerial view depicted a single light aircraft parked near the hangar. with a 3,600' runway labeled simply as "Landing Strip". A 1972 aerial view depicted Forrestal as having a single paved Runway 2/20. 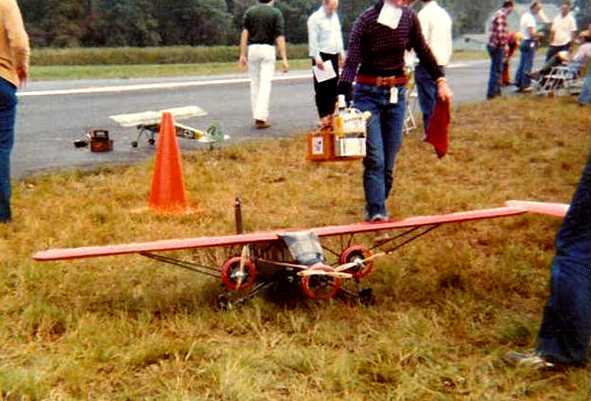 A 1977 photo by Jim Hann of radio-controlled model aircraft being operated from the runway at Forrestal. Forrestal's Runway 3/21 was replaced by a new Runway 2/20, which was also located somewhat father south. as both runways were the same length – 3,000'. The 1979 NY TCA chart (courtesy of Bill Suffa) depicted Forrestal as having a single 3,000' paved northeast/southwest runway. apparently with permission of the Forrestal center. with the 2 runways labeled simply as "Landing Field". 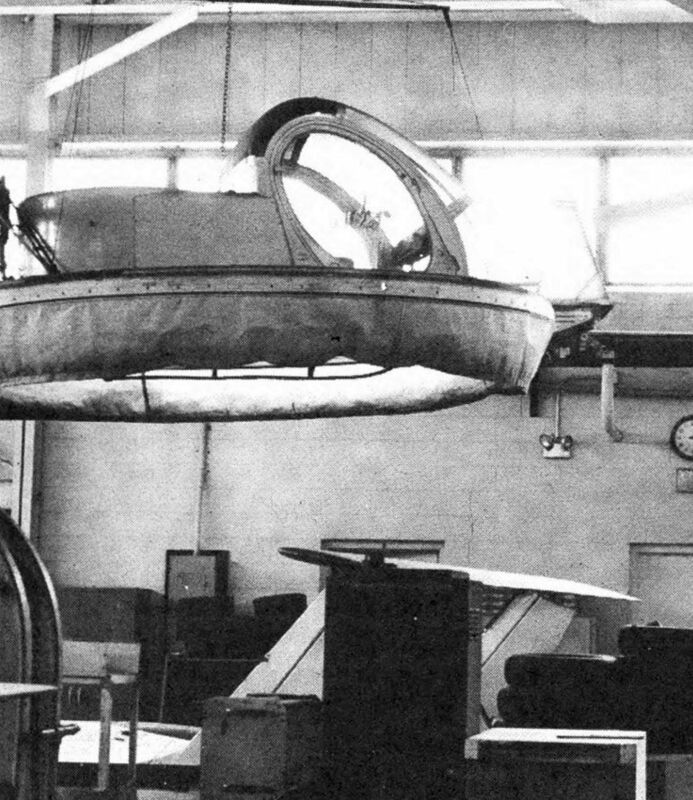 showing the Princeton AgGem hovercraft hanging from the ceiling, and what appears to be the tails of the P-GEM hovercraft at the bottom. The 1982 AOPA Airport Directory (courtesy of Ed Drury) described Forrestal as having a single 3,000' asphalt Runway 3/20. and a ramp on the west side containing an office & 2 other buildings (hangars?). The remarks said: "Caution: Autos, gliders, balloons. Prior permission required. Limited to university business only." The University disbanded the flight laboratory in 1983. Jim Hann recalled returning to Forrestal in 1983 for a radio-controlled model aircraft competition. “The runway was still in really good shape, as it had to be for the models. I remember walking across the runway and into the woods at least once to help a fellow competitor retrieve his wreckage. A circa 1980s aerial view looking southwest at Forrestal Airport by Philip Kineyko. and by that time most (if not all) of the flight research had been suspended. some automobiles, and assorted other modes of transport. 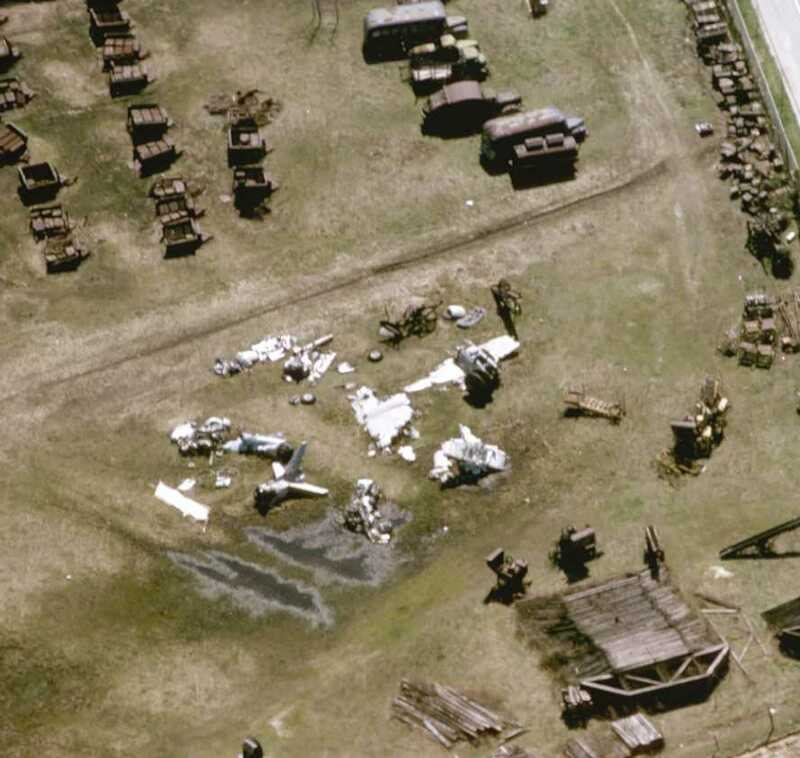 The last photo which has been located showing Forrestal Airport was a 3/24/87 USGS aerial view. The runway was still intact, and a single light aircraft was parked near the hangar. The outline of the former Runway (on a slightly different alignment, 3/21) was still perceptible. 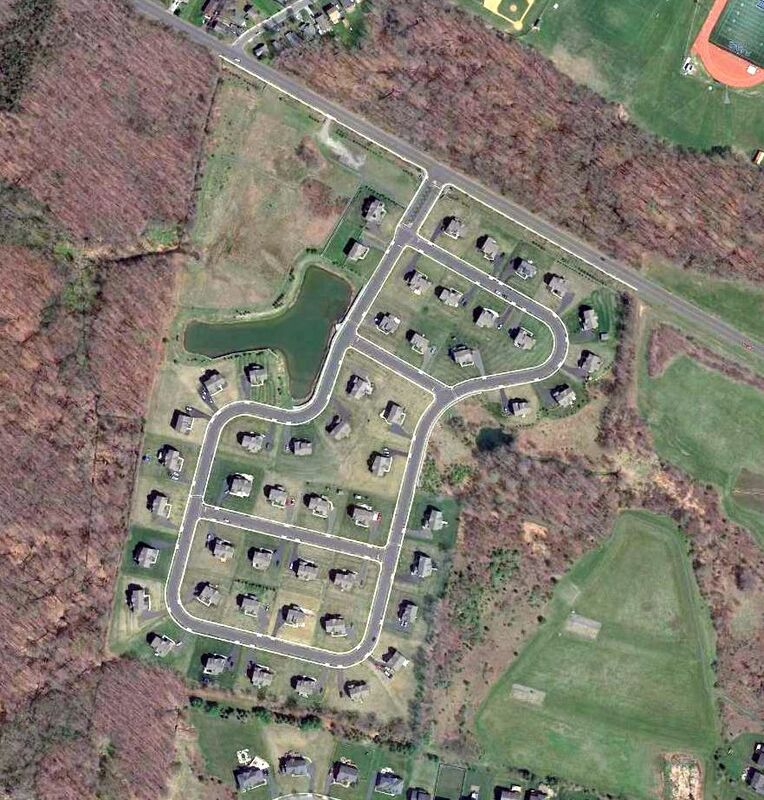 Steve Sweeney pointed out: “To the left of Runway 2 is a long narrow building. That is the Princeton Long Track. An inverse wind tunnel, where the model rode on a sled suspended by a fixture riding on a track. Very interesting & unique. The last aeronautical chart depiction which has been located of Forrestal Airport was on the 1987 NY Terminal Aeronautical Chart. It depicted Forrestal as a private airfield with a 3,000' paved runway. Erik Mann recalled, “The airport was active as a glider operation through 1988 & into 1989. The Soaring Society of Princeton University operated 3 gliders & a Piper Supercub towplane. At one point, there were more than 70 members in the club. with some additional activity on weekdays, including launches behind an old Buick station wagon. and there wasn't much justification for a $10 million gliderport. The date of closure of the Forrestal Airport is unknown. A 1995 USGS aerial view looking northwest showed Forrestal Airport's runway & taxiway had been removed, but the hangar still remained. The airfield was no longer depicted at all (even as an abandoned airfield) on recent aeronautical charts. The property is now used as the Rockefeller Medical Research Center. A 2005 aerial photo by Tom Kramer, looking southeast at the site of Forrestal Airport. a building has a red windsock on top, and a portion of the former taxiway with a private helipad marking. A 2016 aerial view looking northwest showed Forrestal Airport's runway & taxiway had been removed, but the hangar still remained. Thanks to Tom for pointing out this field. "Princeton's James Forrestal Campus: Fifty Years of Sponsored Research", Princeton University.